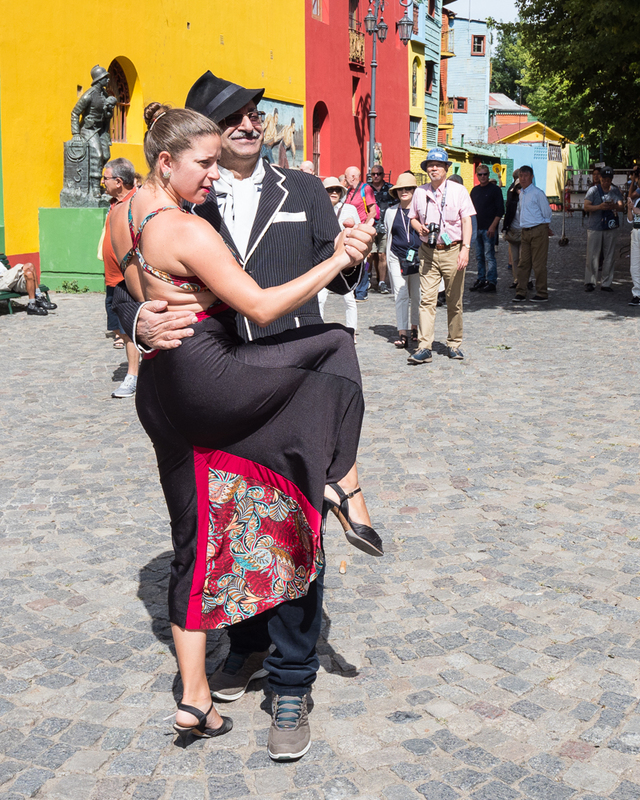 We did spend an extra day in Mendoza Arg. 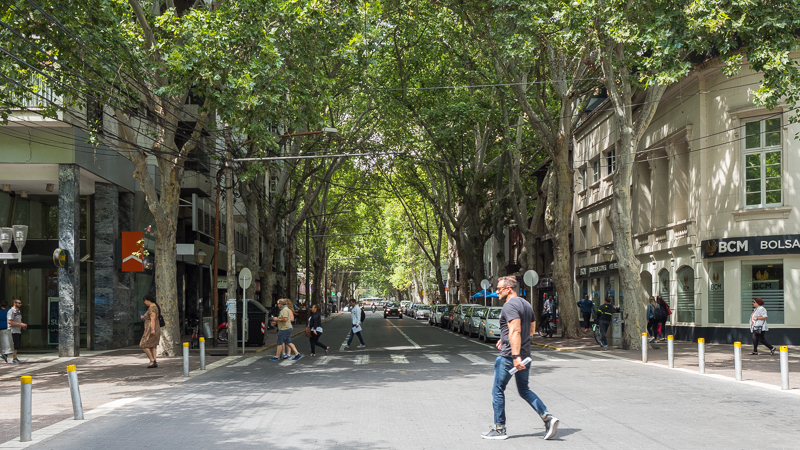 which is beautiful and the city has gorgeous tree-lined wide streets and is surrounded by vineyards. 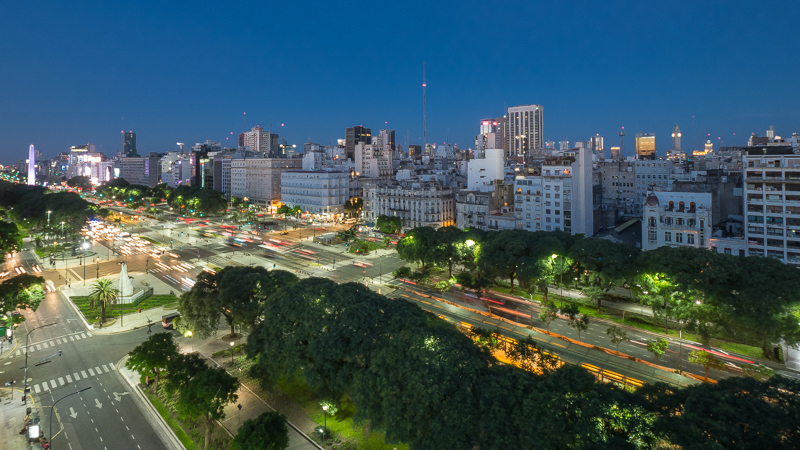 After checking our truck into the Zarate Port on Friday the 19th, we spent a week exploring Buenos Aires. Very European atmosphere and architecture but a tad warm for us. 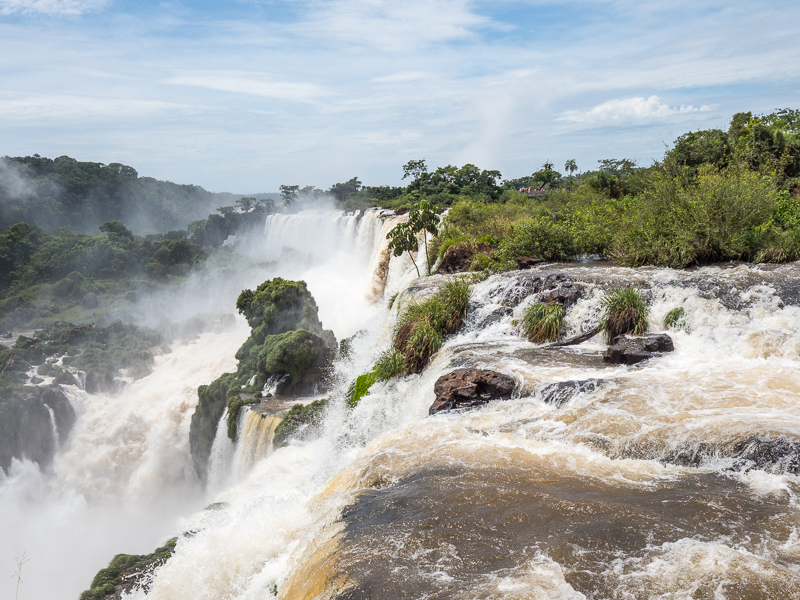 Then we flew up to the Iguazú Falls on the Arg. side where it was steaming. But oh my god, the Falls were incredible. Definitely one of the highlights of the whole trip. It’s not that they’re so tall but they stretch about a mile long. 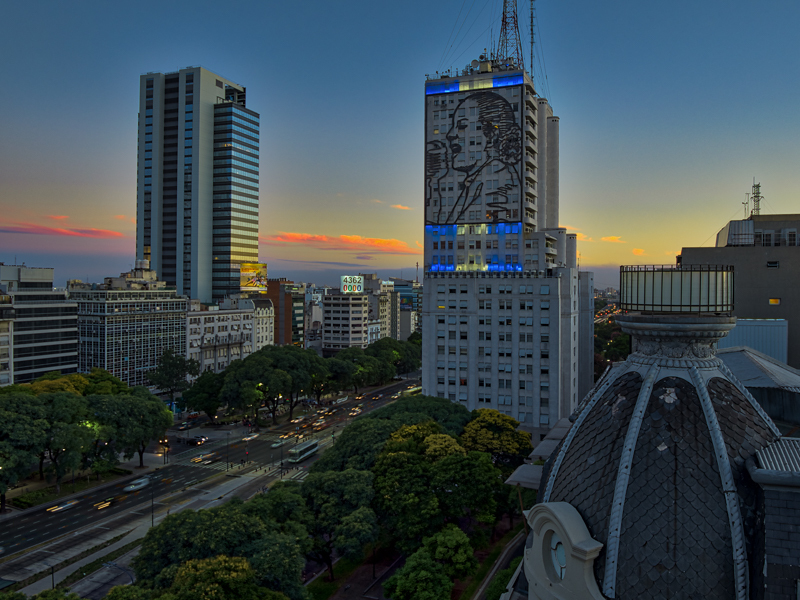 Back to Buenos Aires for the weekend and then flew down to the Arg. 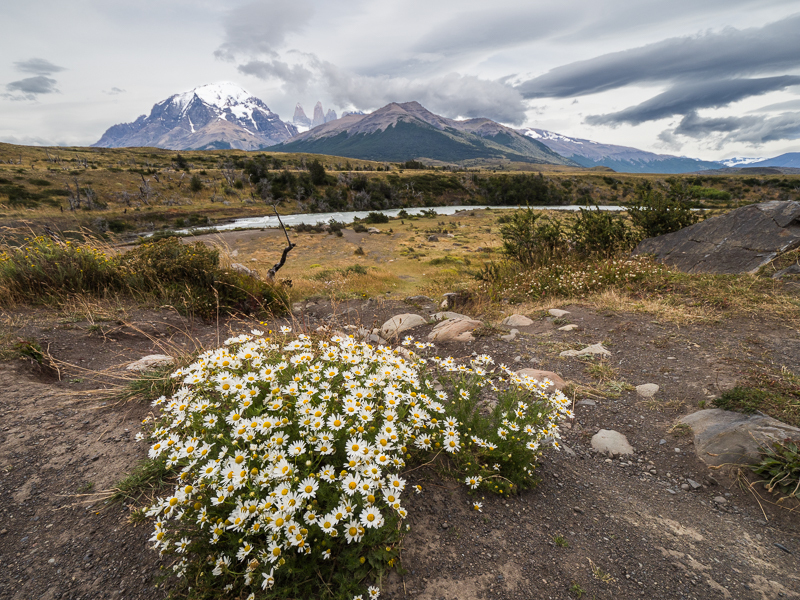 Patagonia area in El Calafete, after buying new cold weather gear since this trip, although originally planned before we left CA, our gear had been shipped in the truck because we hadn’t planned on going when we called an early end to the trip. We took a 15 hour round trip bus tour that left Arg. and entered Chile to go to the Torres del Paine Natl. Park The epitome of Patagonia. (And then reversed back through the border to El Calafete.) Turned out to be another highlight of trip. 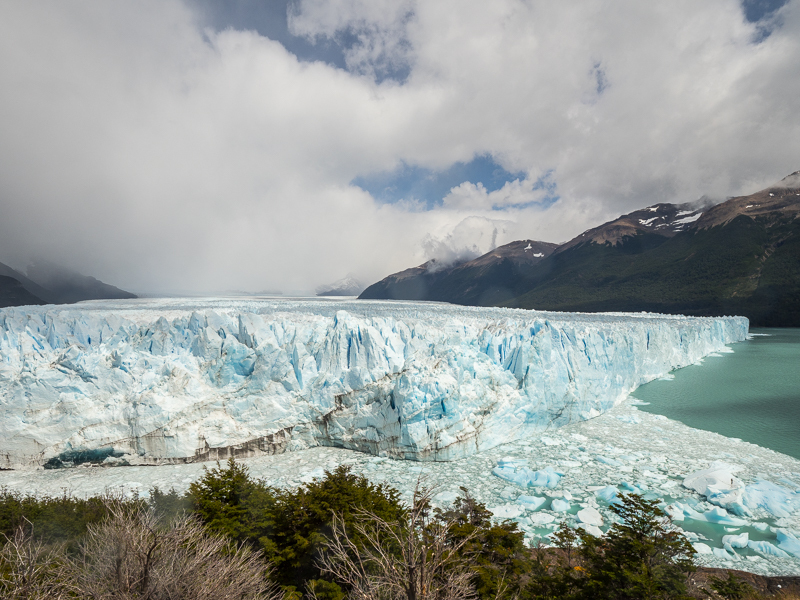 Visited Moreno Glacier from El Calafete – incredible. All this time Dave is having to cope with the pain from his cracked rib. Flew back to Buenos Aires for the weekend. Then flew into Miami FL on Monday Feb. 5th. Stayed in Miami Beach area and one day we did a self-guided walking tour of the Art Deco District in South Beach. But we only got through half of the stops because we were oohing and aahing over the architecture. The next day we took a driving tour with our Uber driver we met the day before of the major Miami neighborhoods. Just the highlights since wanted to get familiar with Miami. 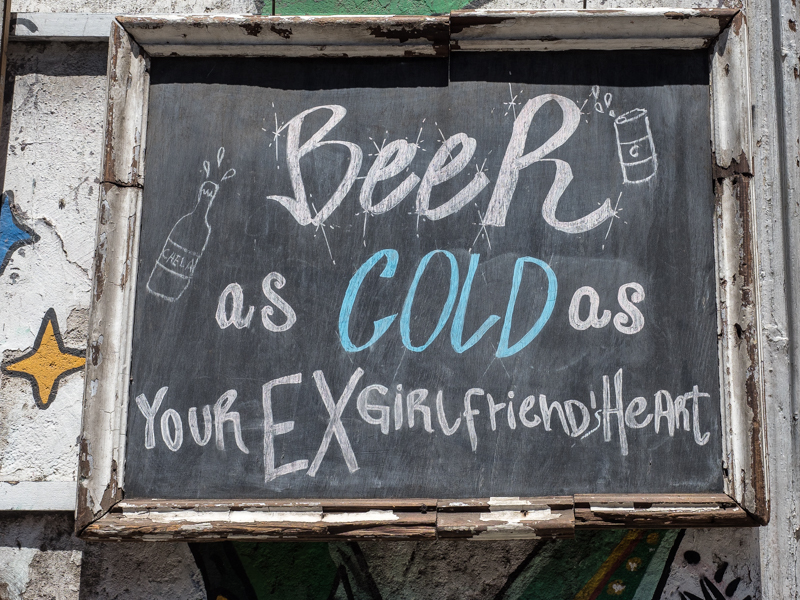 We stayed and explored Old Havana and the immediate neighborhoods for a week. I knew there were many old “Yank Tanks” there but I didn’t expect every third car to be over 50 years old. And the architecture of the old historic buildings, while bring decrepit and badly in need of repair, was gorgeous. What a character! The price for posing was the cigar. A doctor and her baby. Royber hooked us up with a neighbor who came in every morning and made us breakfast. And then later in the week we turned to her to make our late lunch meals as well. Good cook with typical Cuban food. Royber also hooked us up with another friend who collected us one evening in a 1948 Chevrolet convertible and took us for a spin on the Malecón. Really great. Another day Dave had made arrangements before we arrived for a day-long photo guided tour with Alfonso. He took us to places we wouldn’t have seen including an avant-guarde dance rehearsal and my personal favorite (not!) 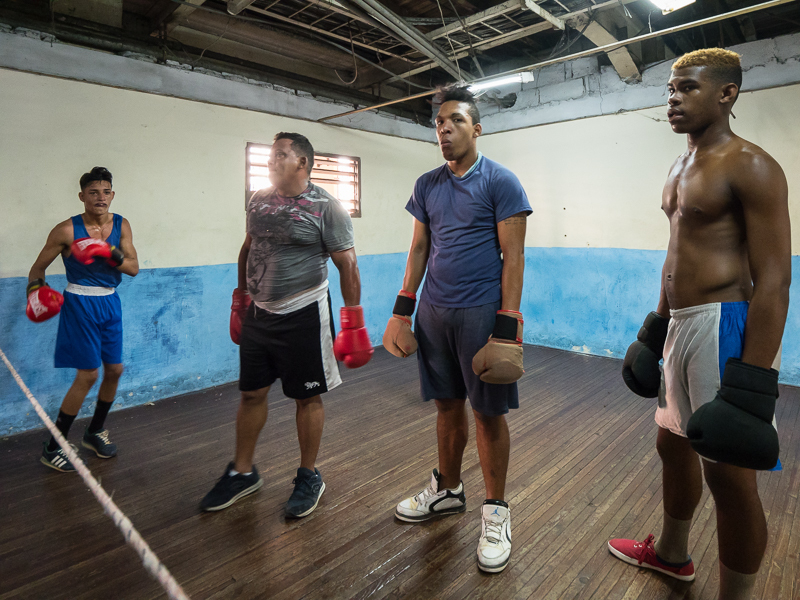 boxing club where young men were training. Not that I didn’t mind watching sweaty young male hardbodies, I just felt strange watching while Dave was photographing. 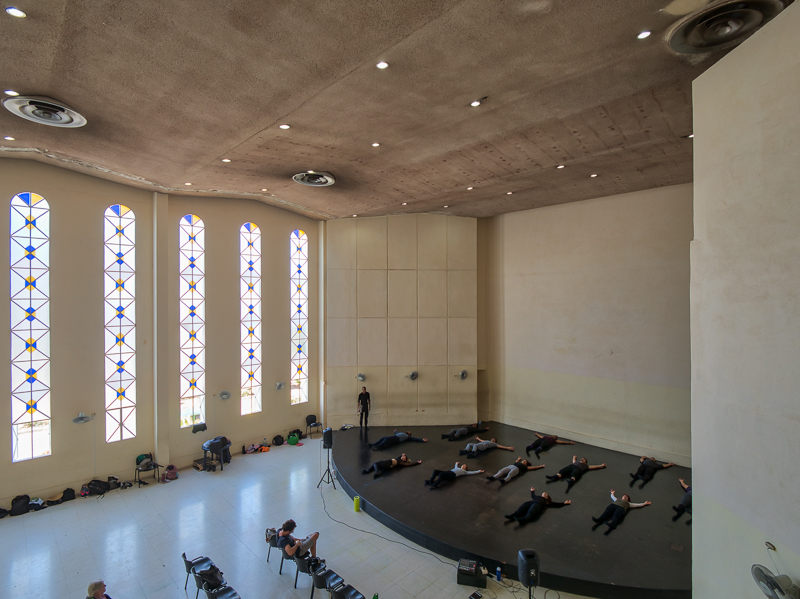 Dance rehearsal in the auditorium of a Jewish synagogue. Havana Cuba – Bucket List check off. After our week was up, we flew back into Ft. Lauderdale and picked up a rental, stayed in another AirBnB (where another guest gave us the flu – but more on that later) for two nights while we went to visit the historic Bonnet House. 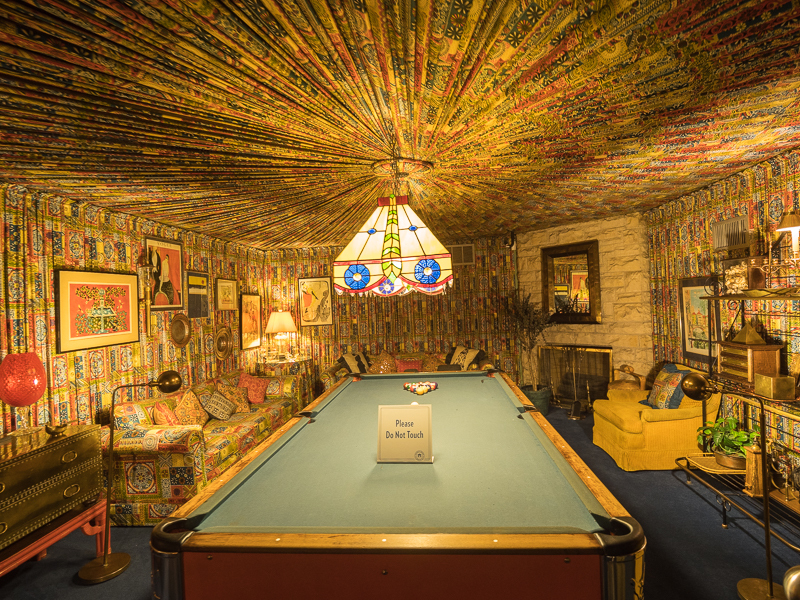 Great family home of two wealthy artists who built the house in the 30’s. 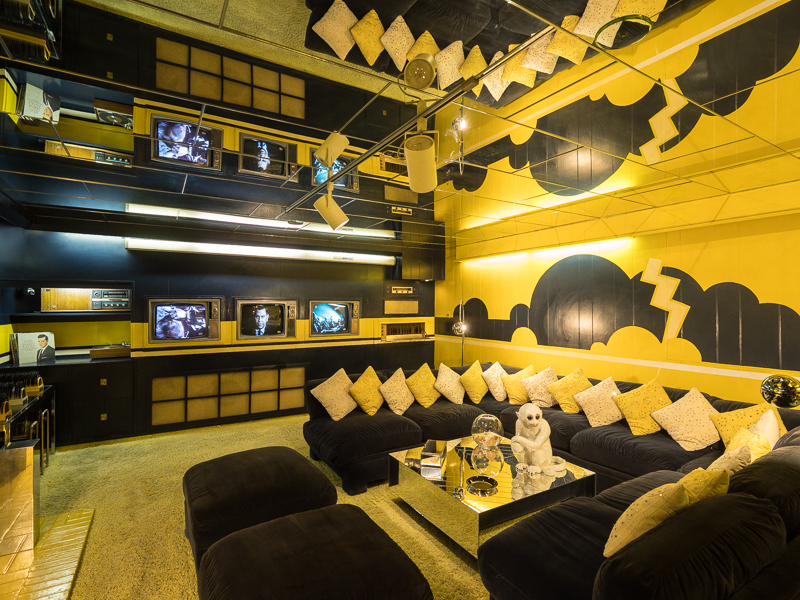 Quirky with lots of art pieces – theirs as well as collected items. On Sunday Feb. 19th we drove across the Everglades on Alligator Alley to Punta Gorda just north of Ft. Myers to see friends Carl and Cynthia who retired from the Bay Area and resettled in FL in a gorgeous retirement community complex right on the Gulf of Mexico. The Motel was super good about keeping us in rooms even though they were completely booked even if we did have to change rooms three times. Although Dave was still feeling bad, we decided to drive down to Key Largo on our way to Key West for a few days. I drove across the southern part of the Everglades while he slept. The entire drive from Ft Myers down the west coast through Naples is nothing but relatively new housing gated communities and the related strip malls. Indistinguishable. Bland, boring with no redeeming architectural value. Saw a bit of hurricane damage around Naples. Checked into a hotel resort in Key Largo on Sat. Feb. 24th. Dave was not feeling better and then lost his voice from all the coughing. The only good news was that his rib was mostly healed and the coughing didn’t re-injure the rib. I felt good enough I went out on a boat trip to see some manatees. Then the boat went out into the mangroves where I, two mother/daughter teams and the guide kayaked our way through the mangroves. The following day I signed up for a snorkeling trip out to reefs on the Oceanside while Dave recuperated in the room. Just sad he didn’t get to enjoy the gorgeous weather and sun and water. We drove down through the Keys on Feb. 26th spotting Hurricane Irma’s path through the Middle Keys to Key West where we visited Ernest Hemingway’s and the six-toed cats’ home. We also did an interesting tour through President Truman’s winter home and took the tourist trolley train ride around the old town of Key West. Key West is an interesting town historically, architecturally and culturally. We had great weather while sightseeing. After checking out of Key West on Thurs. Mar. 1st, we headed back to the Florida mainland and took several days driving up the east coast with a stop in Port St. Lucie and the Kennedy Space Center in Titusville. The Center is Disneyland for adults with many exhibits and tours even for the non-space enthusiasts like me. But expensive even with the Senior discount at $46/per person. We arrived at our long-time friend Ronnie’s home in Jacksonville on the 6th to await the truck’s arrival on the ship the Baltimore Highway. We had a good long visit while she graciously put us up during the ship’s uncertain arrival date. On Mon. Mar. 12, after the by now expected hassles with the shipping company, Customs and Port Terminal officials, we retrieved our truck/camper (which arrived intact and in good shape), turned in our car rental at the Jacksonville Intl. Airport and we started our drive across the US. Our first stop was in Tallahassee FL for the night. We arrived at another long-time friend Shirley’s home in Decatur AL on the 13th. During our few days visit with her, we toured both the Decatur and Huntsville historic home districts with houses dating back to before the Civil War. We also toured Huntsville Redbrook Space & Rocket museum which was also interesting if not also expensive like the Space Center. We left Decatur on Mar. 16th and drove to Memphis TN with a stop at Helen Keller’s birthplace museum in West Tuscumbia AL. 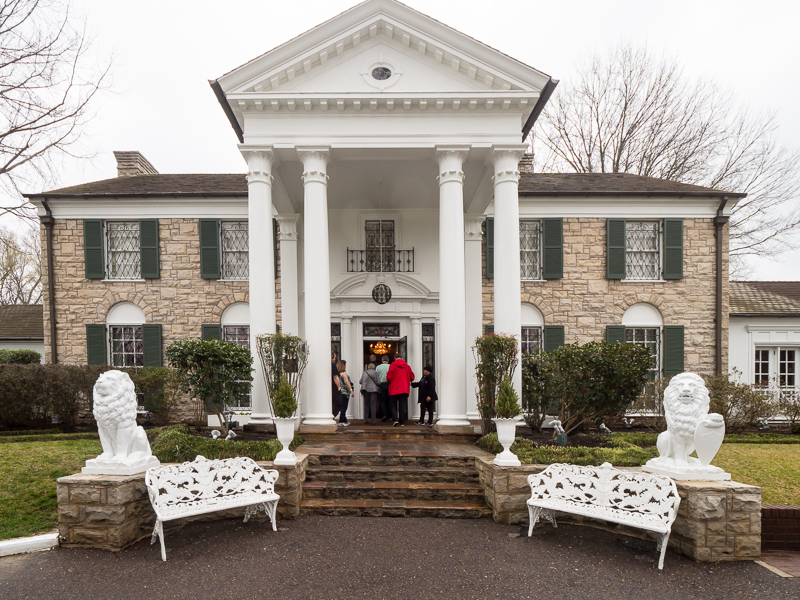 On the 17th, we, of course, had to visit Graceland, Elvis Presley’s home, which was smaller and not as weird as our expectations. On the 18th we visited the Rock & Soul Museum which was very interesting and we spent hours viewing the exhibits and listening to the music selections. A stroll down to the Mississippi River showed the flooding and how swollen overflowing it was. 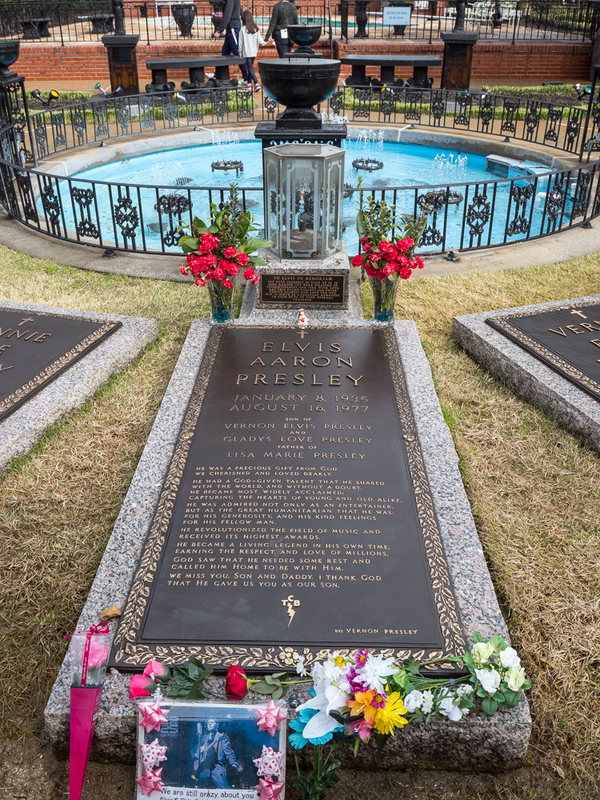 We left Memphis on Mar. 19th and drove across the flooded Delta into AR for a lunch at my Aunt Audrey & Cousin Debbie’s home outside Bee Branch AR where we also got to see Aunt Betty. After a night’s stay in Conway AR, we left on Mar. 20 and drove straight through to my Sister Nancy and brother-in-law’s home in Wichita KS. After almost a week visiting my siblings, we left Wichita on Mar. 26th and met a long-time friend Gay and her new husband Roger in Pratt KS for lunch before driving on through western KS and the OK Panhandle before stopping the night in Dalhart TX. This area is suffering a historic drought and now the prairie wildfires have hit with the Spring high winds. On Mar. 27th we drove through snow flurries on our way up to Taos NM where we visited the historical church photographer the Ansel Adams and artist Georgia O’Keefe made famous. It was gorgeous in the Taos Basin surrounded by snow-capped mountains. And we visited the historical home of Kit Carson in his years as an Indian agent. 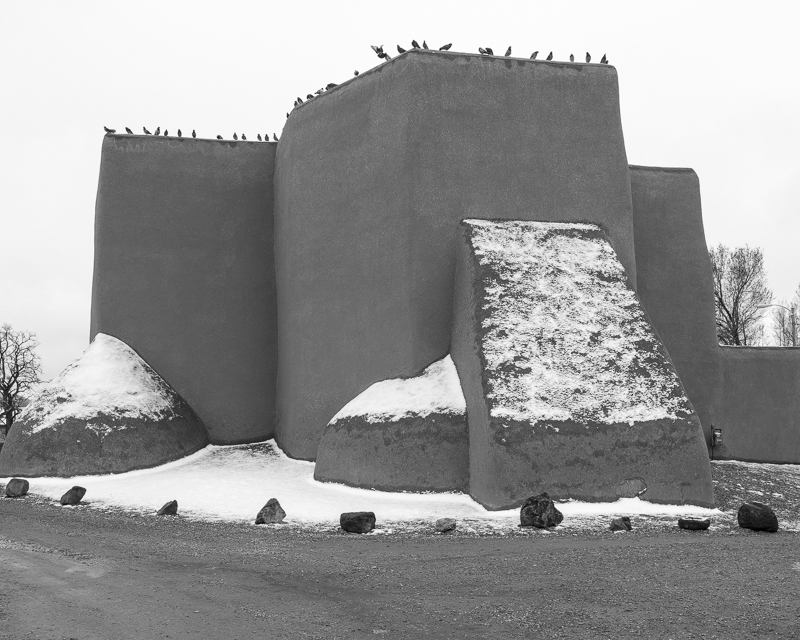 My version of the San Francisco de Asis church which Ansel Adams photographed in 1929. After a few days, we left Taos NM on the 29th and drove straight through to Flagstaff AZ for a overnight stay. 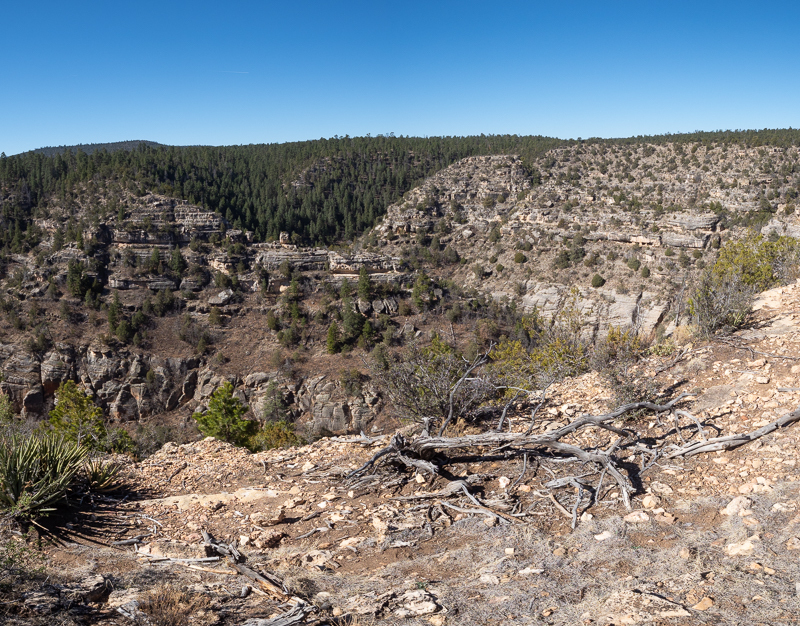 The next morning on the 30th we visited the Walnut Canyon Ruins Natl. Monument outside Flagstaff before meeting another long-time friend Leslie for lunch who drove up from Phoenix. After lunch we headed west on Highway 40 and overnighted after crossing into CA in Needles. Saturday the 31st saw a long drive across the Mojave Desert, crossing the Tehachapi Pass and up Highway 5 to pull into Pacifica around 5pm. Home sweet home. 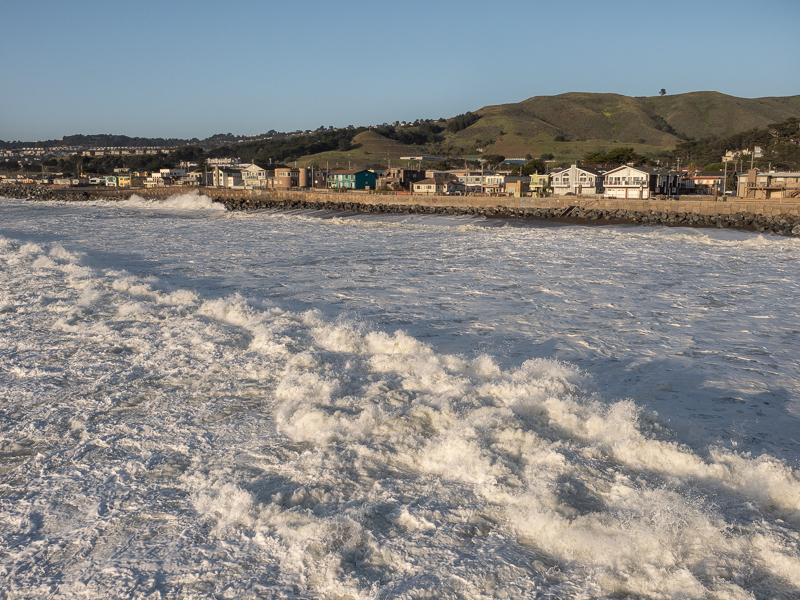 The view from the Pacifica Pier. Exactly two years from leaving on our two year expedition on April 1, 2016. This journey was something we had looked forward to for many years while suffering through horrific tax seasons. It wasn’t like anything we had really expected, but exceeded our expectations in so many ways. But we are glad to be back home and are in the process of re-setting up our home which our tenant vacated at noon on the 31st. The timing of it all was perfect. After we settle in, we’ll start planning our next travel journey. There are many places still on our Travel Wish List but we’ll approach the travel in different ways. Tried to decipher how Darwin figured out evolution from analyzing 13 different species of finches’ beaks in the Galapagos. Spied the closest mountain to the sun since on the equator bulge – Chimborazo Mt. Ecuador. 6268 meters – 20,564′. Watched a sea lion go after a puffer fish, fish expand and get away while snorkeling at León Dormida in the Galapagos. Crossed over the Andes ridge back many times with 15,000’+ elevations with the highest one at 15,960′. Visited the biggest gold museum in the world in Bogotá, Colombia with over 55,000 gold pieces and 6,000 on display at any one time. Enjoyed the climate in Quito, Ecuador – second highest capital in the world at 2,850 meters or 9,350′. Shopped in the largest indigenous peoples’ market in Otavalo, Ecuador that had everything from cows, guinea pigs, 50 different types of fruits and vegetables to embroidered table clothes and woven ponchos. Celebrated Inti Raymí Midsummer Solistice at Lago Cuicocha, Ecuador. Traveled by train to Nariz del Diablo (Devil’s Nose) from Aluasí, Ecuador. Pondered the oddity of which US companies we see everywhere: Sherwin Williams paint stores, Oreos, Ritz Crackers, Zumba, fidget spinners. Marveled at the rice paddies in the Peruvian deserts. Viewed the 3rd longest free-fall Waterfall in the world – Gocta Waterfall Ecuador. Trekked in Peru’s spectacular Cordillera Blanca. Stunned by the Nazca & Palpa Lines from our four-seater prop plane air flight in Peru. 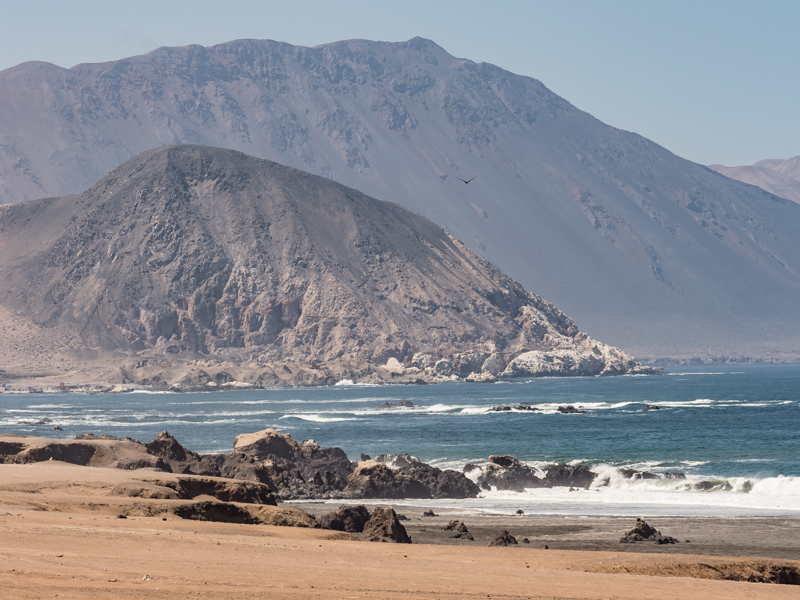 Marveled at the unique Chilean coastal towns in Atacama region: Iquique, Antofagasta and La Serena after leaving hundreds of miles in one of the driest desert in the world – the Atacama. Enjoyed the Pisco & wine tasting in Central Chile. Startled by a huge sun halo over Santiago Chile in midday. 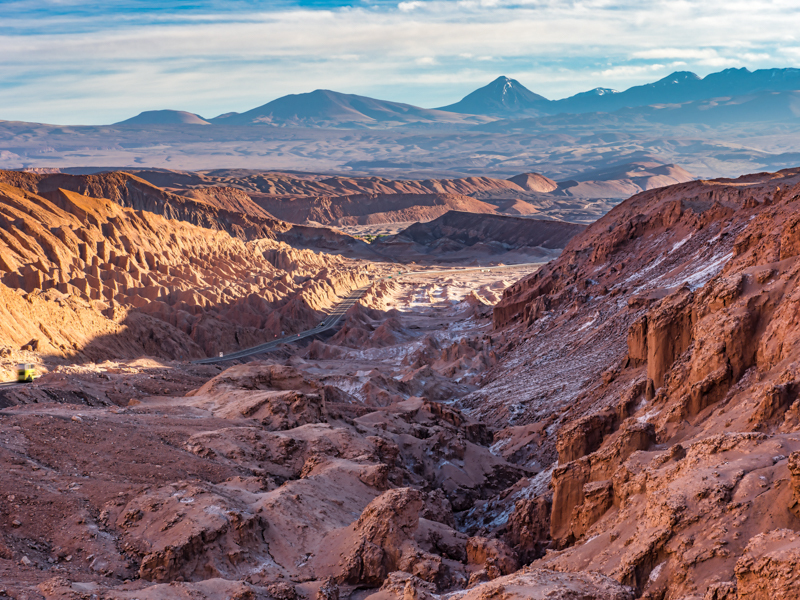 Spied Cerro Aconcagua – the highest mountain in the Western Hemisphere. 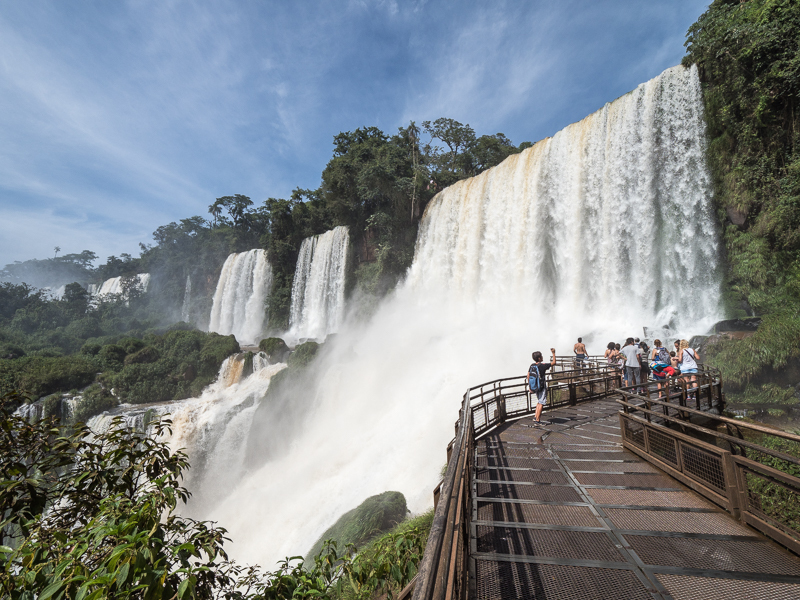 Sweltered but amazed by the walk along the lengthy Iguazú Falls at the Argentinian and Brazilian borders. 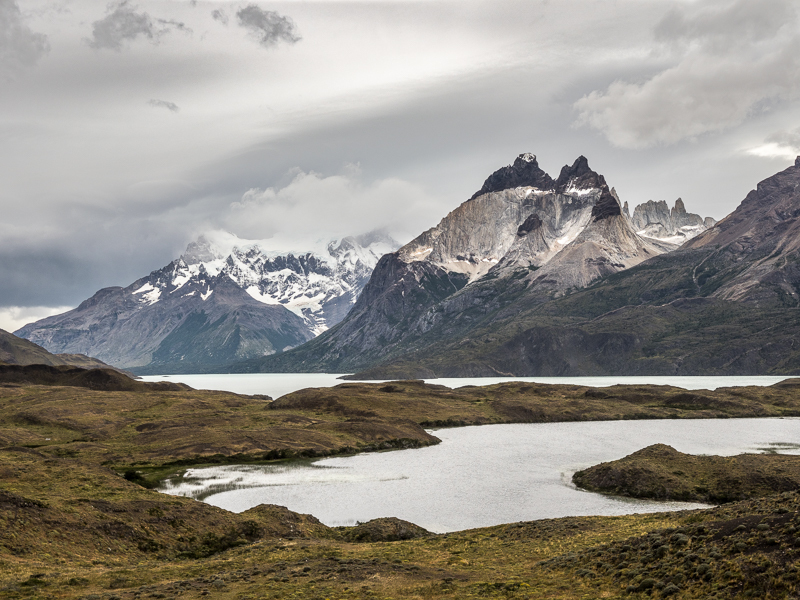 Goggled at Torres del Paine mountain range in southern Chile. Bused over the vast Patagonia Steppes on the way to the Moreno Glacier. 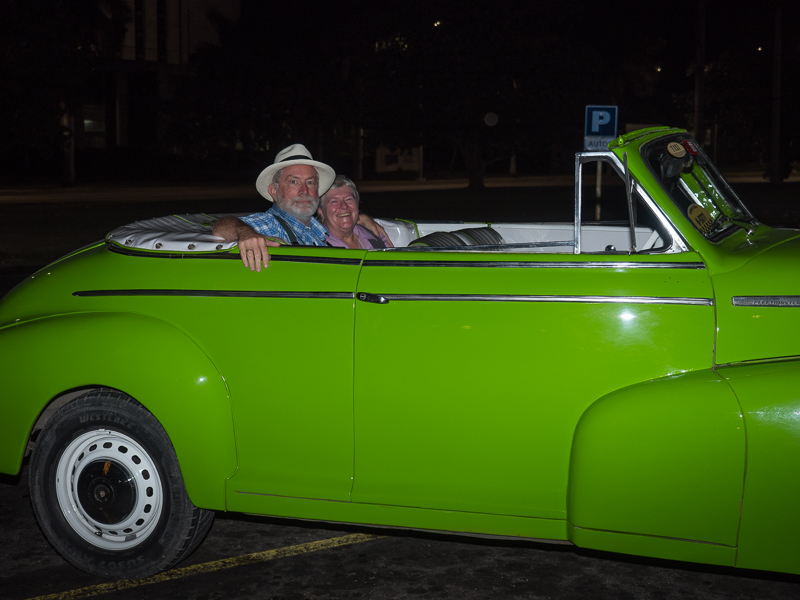 Relived glory days with our 1948 Chevrolet convertible ride on Havana Cuba’s Malecón. Shocked by the size of the Kennedy Space Center’s Titusville FL extensive, informative and interesting exhibits, rockets and launch pads. Listened our way through the Rock and Soul Museum in Memphis TN. Enthralled by Spring time flowering trees in northern AL and AR. 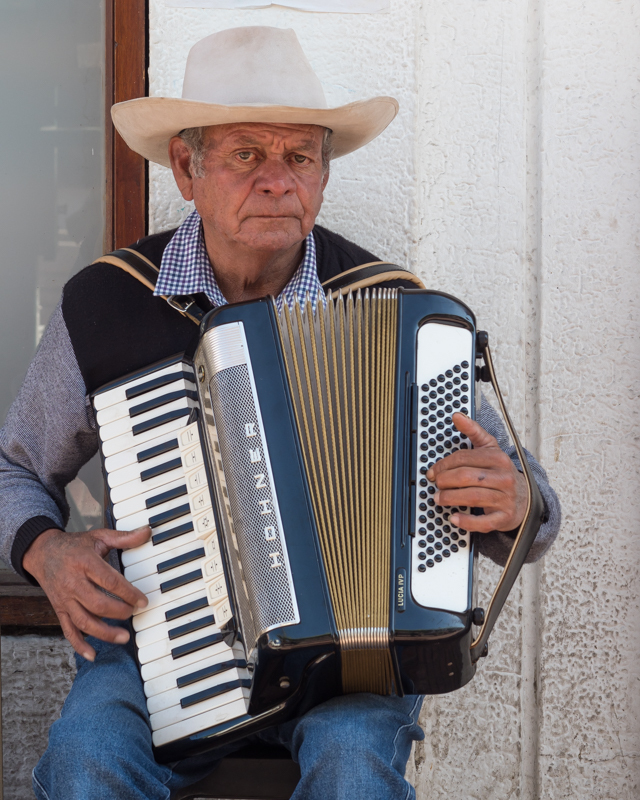 Editor’s Note: We hoped that you enjoyed reading about our little excursion to the lands south of the border. We certainly enjoyed sharing our stories and photos with our readers. The site does not provide a way to auto-notify you that new photos have been added. So you’ll have to bookmark the site and check back periodically. Or you could send me an email address, and I will notify you when new content becomes available. 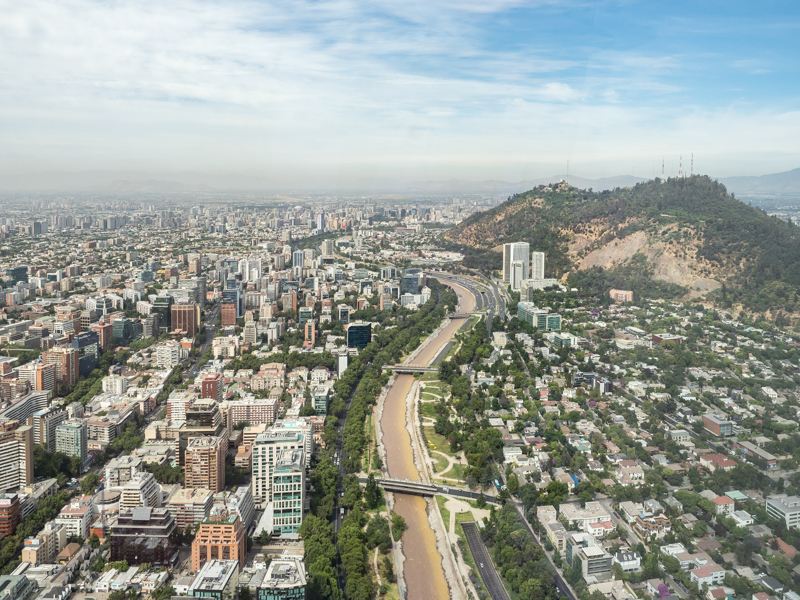 While we were waiting for three packages to arrive from the States, we decided to explore the areas surrounding Santiago. 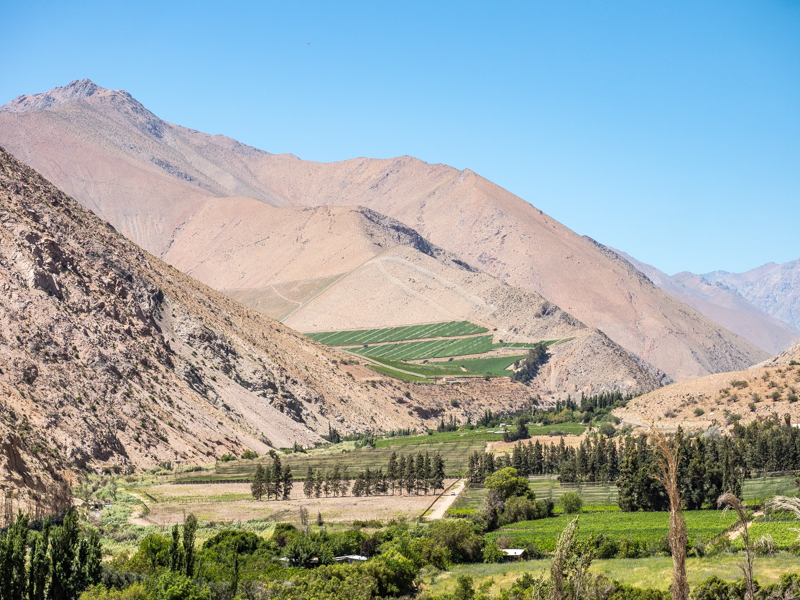 We wanted to start with the Maipo River Valley. But first on Dec. 27th, upon trying to retrieve the truck/camper from the airport long-term parking, we discovered the truck wouldn’t start and because it was parked close to fence to allow vehicles to pass behind, we couldn’t access the hood release. With the aid of a friendly Chilean who wanted to practice his English, we called the mechanic we had used upon first arriving in Santiago who came out and his helper climbed over hood and while propped against fence, found the latch. Using their battery, they jump-started the truck. And told us that our battery was fine and didn’t need to be replaced. 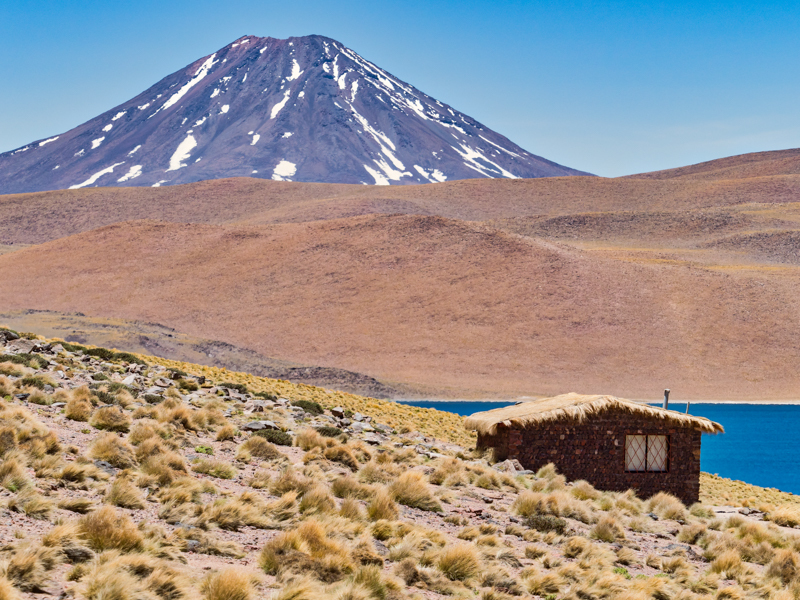 So we left Santiago and stayed at Camping de Sauce in the Maipo River valley southeast of Santiago. Didn’t see many of the vineyards or wineries that the Maipo Valley is known for. The 28th found us continuing up the valley to the Embalsa (reservoir) de Yeso; us and 20+ tour buses. But the buses left around 3pm and we were just left with the numerous dump trucks hauling materials down the mountain. We boondocked overnight at the reservoir while the trucks rumbled by until 10pm and started up at 5am the next morning. 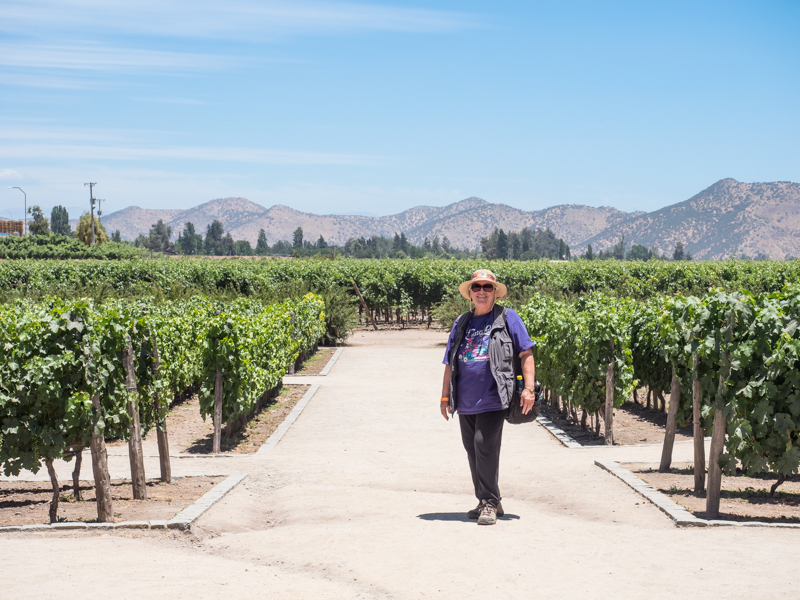 Returning to the flatlands on the 29th, we tried to track down the wineries in Maipo but of the five we could locate, all were closed. We ended up boondocking at a Shell truck and rest area on Highway 5 south of Santiago. Large family traffic though since start of major holiday weekend. The 31st found us celebrating New Year’s Eve at Naviocar; campground was full of Chileans enjoying the lake, pool and BBQs. The New Year found us back on the road to Rocas de Santo Domingo. Beautiful beachside community reminding us of Carmel or an upscale Santa Cruz, CA. We boondocked in the beach parking lot and had a gorgeous sunset to celebrate the New Year. Jan. 2nd we drove to Cartagena just up the coast from Rocas. It was packed because of the holiday and summer getaway. We boondocked in its beach parking overnight. During a walk into town for lunch, we visited their equivalent of the Santa Cruz Boardwalk. On Jan. 3rd we first visited the Humedal Laguna de Cartagena, a very nice bird sanctuary wetlands. We saw the biggest flock of whimbrels we have ever seen. 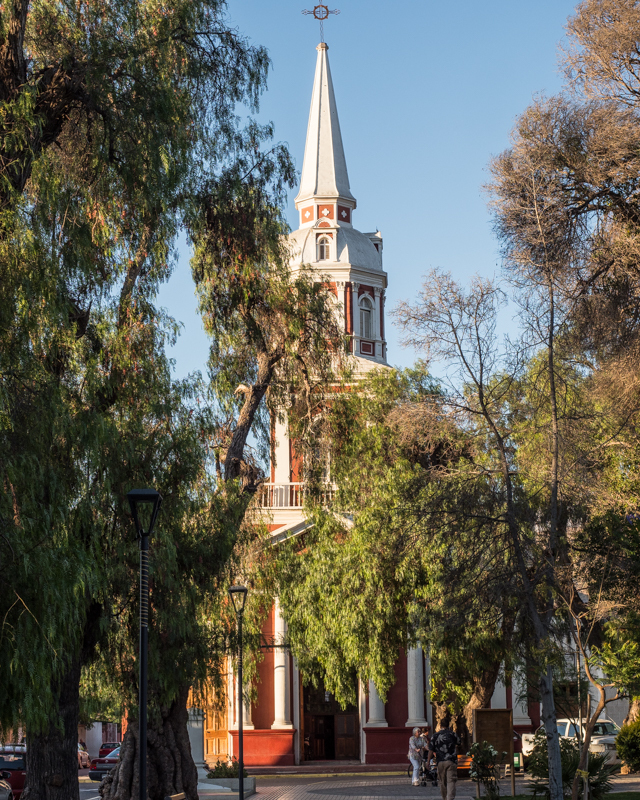 After spending a few hours at the wetlands, we drove to Camping Millantú campground situated on the Rio Maipo. We stayed at Millantú from Jan. 4th – 8th where we relaxed and did some minor work on camper during which time Dave fell on a small step stool and injured his ribs. And gashed his head on camper corner while doing work underneath the camper. On the 9th we decided to return to Santiago to see about the status of our packages in person. But once again the truck wouldn’t start. A campground worker gave us a jump-start directly. We drove into Santiago and parked in the Parque Arauco Mall to get a new truck battery, groceries and use the wifi at Starbucks. However during the process of opening and closing the truck hood to view the battery specifications, the pain from Dave’s injury caused him to double over and almost fall to the ground. Security staff rushed to his aid and wheeled him into the Mall’s paramedics station in a wheelchair. The paramedic couldn’t help him but made arrangements for an ambulance to take him to a private hospital to see a doctor. After 10 hours of doctors exams, two x-rays and a ct scan, it was determined he had fractured a rib. The good news was that it only cost $383 including ambulance ride. A political note here: The doctors were efficient, qualified and spoke English as well as Spanish. The hospital was modern with all new equipment. Puts the USA medical system to shame where the same tests and treatment would have cost possibly 100 times greater. We know from personal experience the ambulance ride alone would have been $3600. By the time it was diagnosed and medication prescribed, we didn’t have access to the truck/camper locked in the mall parking lot since it was so late and after checking in with six different hotels, couldn’t find a hotel room until the doctor that saw Dave last, got us a reservation at a faculty that is a hotel for rehab patients. The 10th was spent in the hotel while Dave recuperated. Dave felt he could move enough on the 11th to keep on with our errands, so we first went to the Aeropost delivery company and raised hell about the long delay with our packages. The local boss, Jaime, said he would look into it after we specifically pointed out which invoice pages he was missing and what added up to what items in each box. We returned to Parque Arauco Mall, purchased a new battery, installed it, bought groceries and settled in at Starbucks to use their wifi while waiting for Aeropost to call. At 5, we received the call from Aeropost and they had the packages. After an Uber ride there, we picked up packages and took Uber back to truck/camper. At which time we discovered some crook had punched out our truck’s passenger door lock and stole some of David’s camera gear and some camping gear while we were gone; although there were security guards and even a group of 7 Chilean police nearby. Feeling disheartened and in pain, we boondocked at a nearby gas station to re-evaluate what to do next. 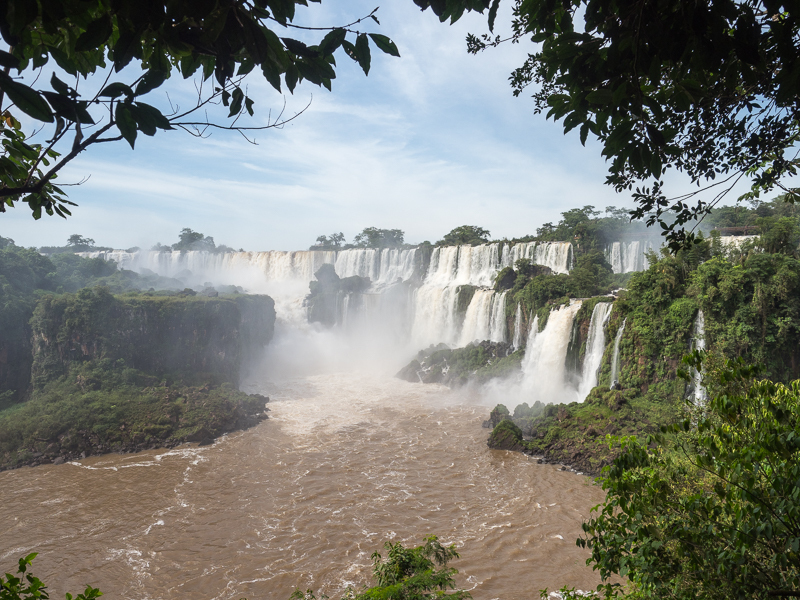 After a night of mulling over options, we have decided to call it quits after 21 & 1/2 months on the road and 25,000 miles and forego driving to South America’s tip because in many ways, that would have been the most difficult part of our journey. Currently we’re in an airport hotel looking for ways to get the truck/camper shipped back to USA. This entry will end our blogging. 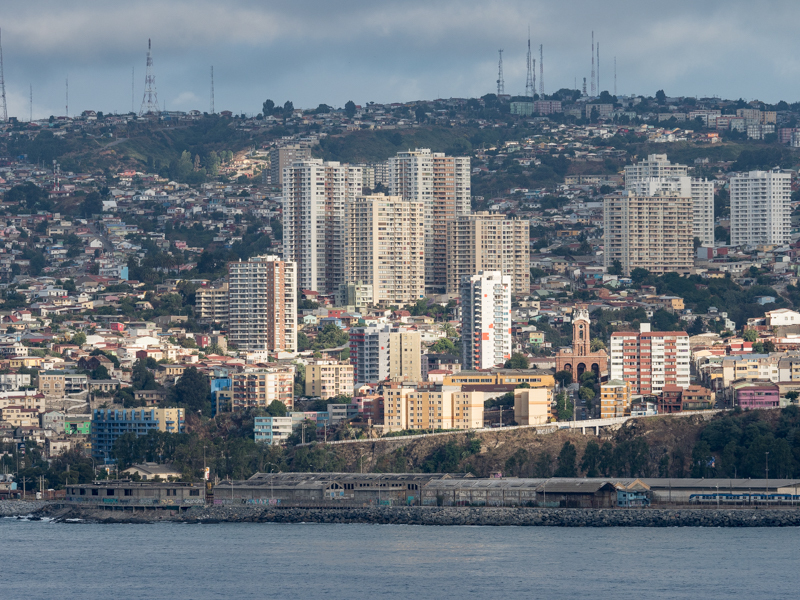 On Dec. 13th we left Valparaiso, retrieved our truck/camper from the campground where we had parked it and drove to Santiago and checked into CityExpress Airport Hotel since they had free parking. The first thing we did was take Uber to Aeropost to set up an account. Dave had been told by Aeropost in an online chat that we had to go to this particular office on Ave. Nataniel Cox to set up a RUT account (similar to a US SSAN) since we couldn’t ship into Chile without that number. Once there we were told we could have used our passport number to open up an account. The mis-information that Dave received caused us over a +two week delay and that’s why we stayed as long as we did in Santiago and its environs. After getting the Aeropost account set up, we took Uber to mechanic Mario Oyance Lubricentro mentioned in iOverlander to set up an appointment to get regularly scheduled oil change, tire rotations, inspection of tires and various other truck maintenance items. When we returned at 7:30am on the 14th, Raul, the mechanic, efficiently got everything done by 9:45. He and Mario were friendly, courteous and inexpensive. Mario, the owner, even gave us a bottle of wine as a parting gift. 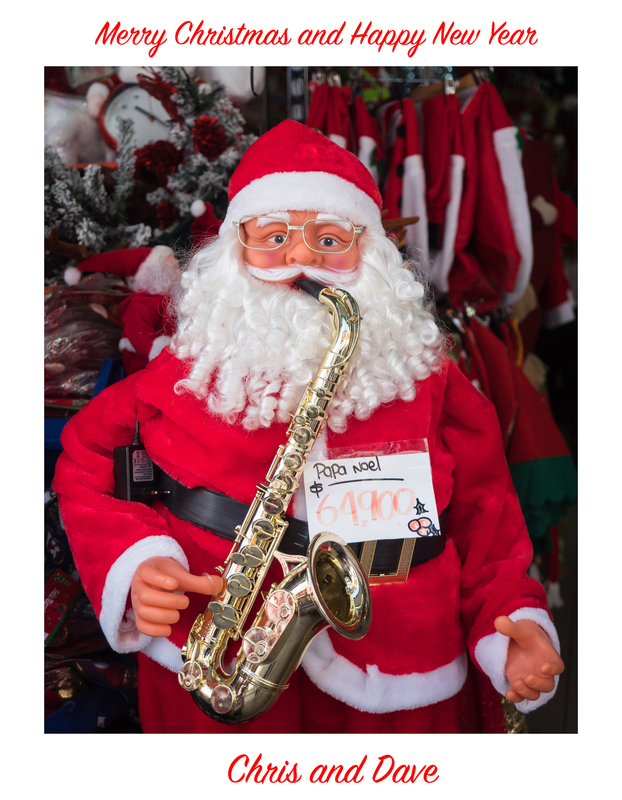 On Dec. 15th we drove to the Airport’s long-term parking lot and left the truck/camper and took a taxi into Centro and checked into the Hotel Sommelier Boutique on Merced. On Sunday 16th we were successful in locating the Hop On Hop Off bus and a newspaper kiosk who sold us a ticket. 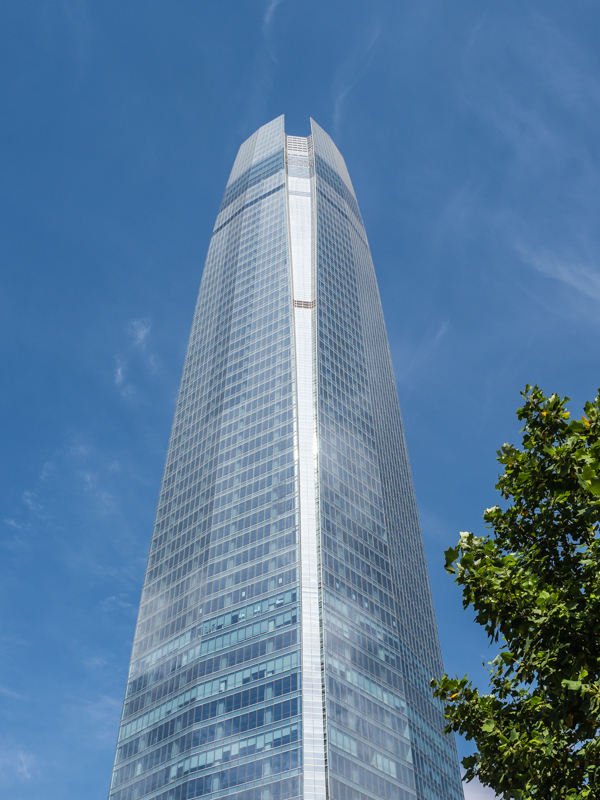 We rode the circuit with one stop at Costanera Mall and the Sky Costanera Tower. Tallest building in Latin America – 62 stories. The Tower is the tallest building in Latin America with 62 floors. It ranks in the top 15 tallest buildings in the world. We took the $30 elevator ride! up but it was so smoggy that only glimpses of the Andes were visible. 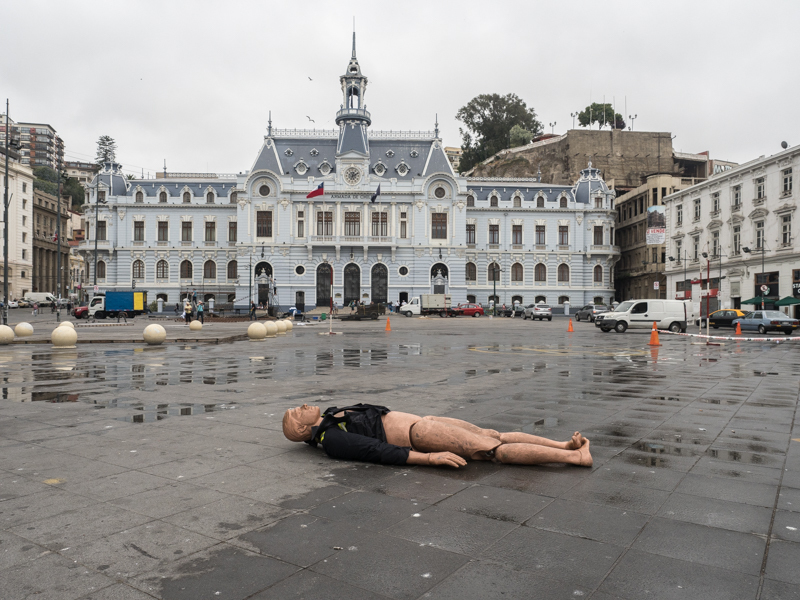 The 17th was Chile’s Presidential election and though we visited the Plaza de Armas, the cathedral and palace and everything was closed because of the election. Monday the 18th found us searching for and visiting a dentist. But the highlight of the day was after looking up at the sky, because everyone else was, to see a sun halo. It was our first sighting of this natural phenomenon and although we have seen moon haloes, this was very impressive and stayed around for hours. (Halo is the name for a family of optical phenomena produced by light interacting with ice crystals suspended in the atmosphere. On the 19th we were able to get into the central Post Office to observe the architecture, the Metropolitan Cathedral, the Centro Cultural Estaćion Mapoche (restored historic central train station) Museo Histórico Nacional where we were limited to only one floor due to maintenance and the Parroquia Milagroso Niño. 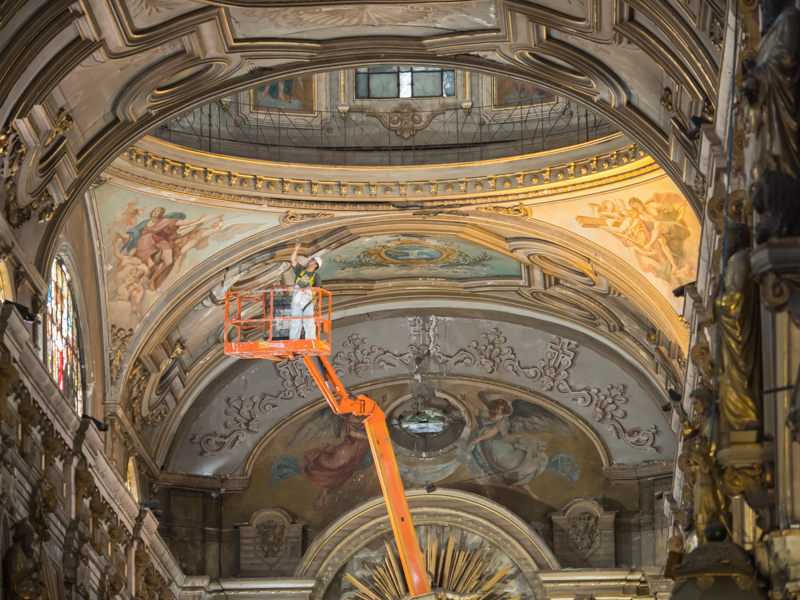 Restoring the artwork on the ceiling in the Metropolitan Cathedral. 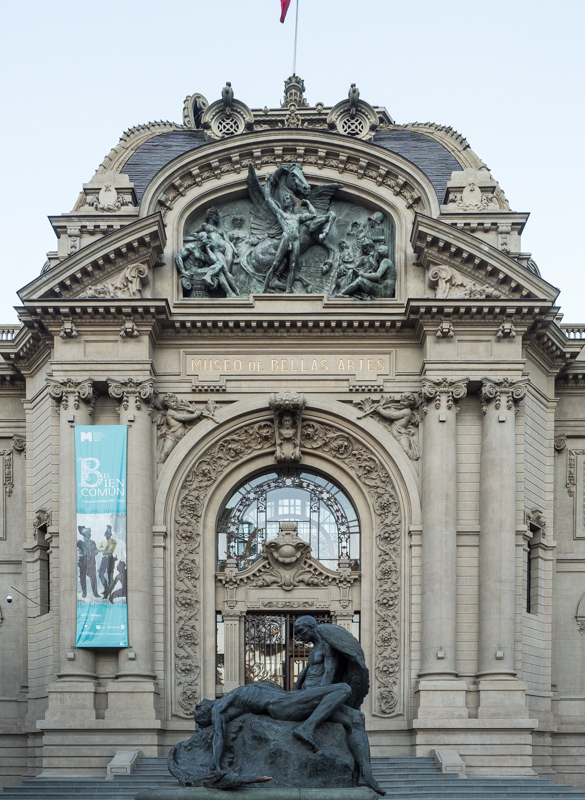 On the 21st we visited the Museo Nacional de Belles Artes, a restored 1910 Paris’ Petit Palais-style which now is home to traditional art pieces as well as modern visiting exhibitions. We were fortunate to hook up with Pacifican friends Deb & Kevin who are vacationing in Chile in the afternoon for lunch and into the evening for catching up. The Hotel Somelier moved us into a suite and at this point I must say the Hotel and this room was just about perfect. This Hotel is centrally-located site within walking distance to all sites in Centro, bountiful breakfast buffet (even if the same every day) quiet and spacious room, big and exactly needed firm bed, friendly staff, and great bathroom and shower. Our first outing on the 22nd was to take the funicular up to the Cerro San Cristóbal but after walking to the station, discovered the funicular was closed for maintenance but Turibus was operating a bus up to the top. Once on top, the smog again prevented a clear view up to the Andes. After returning down to the Centro via a bus, we walked over to Pablo Neruda’s house. There was a steep entrance fee so we didn’t visit the house but we did get to see the pavilion outside the house set on a hillside lined with approx. 15″ pavers set slightly apart to allow water to flow around, through and down the terraces. We signed up for a Maipo Valley wine tour on the 23rd. And once again off to a poor start since 20-25 minutes late. It is operated by a Southern California man who has moved to Chile with his fiancé and has studied to be a sommelier in Chile. He drove and navigated and we were joined by a mother/son from Ohio. We first visited Haras de Pirque, a secondary business after horse racing for the wealthy businessman owner. Consequently there is a recurring theme throughout winery including the building shaped like a horseshoe to the wines named for some of their horses. It was recently sold to a big Italian family well known for their wines. 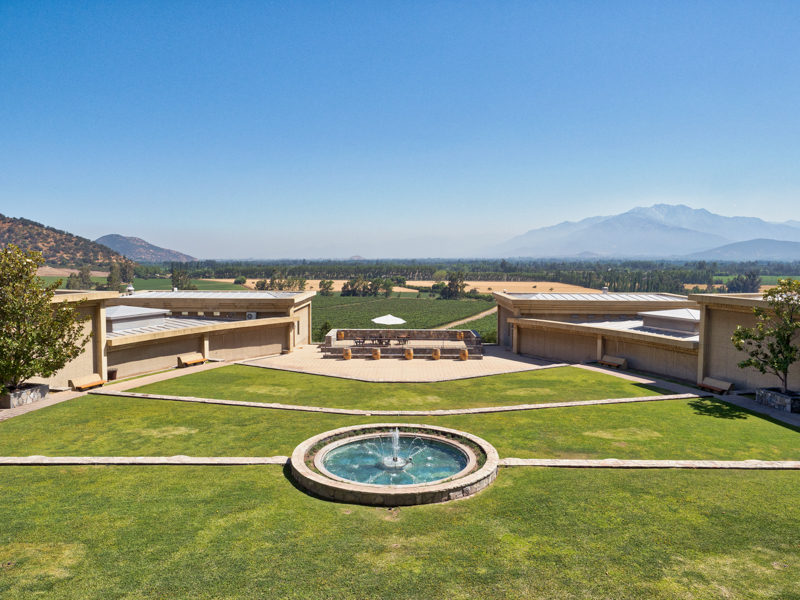 Our second tour and tasting (and lunch) was at Concha y Toro – one of the largest wineries in Chile if not the biggest. 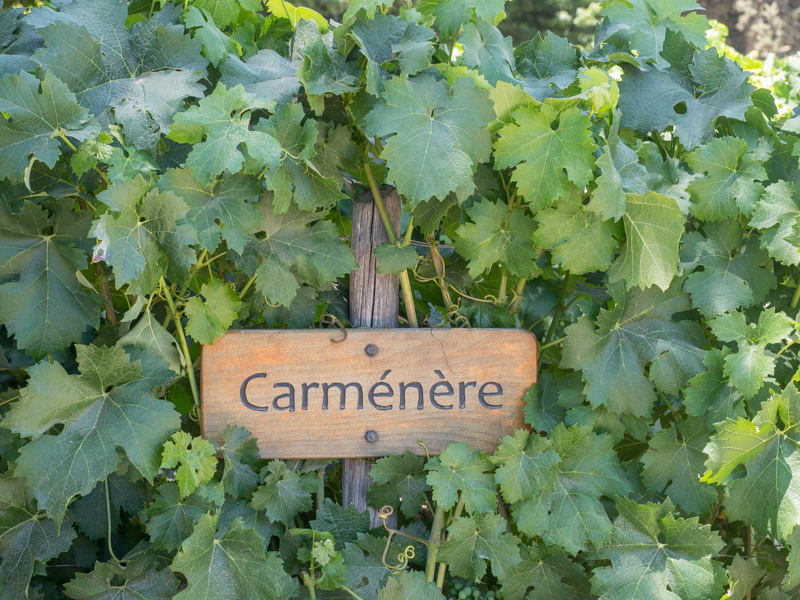 Chile’s national grape. 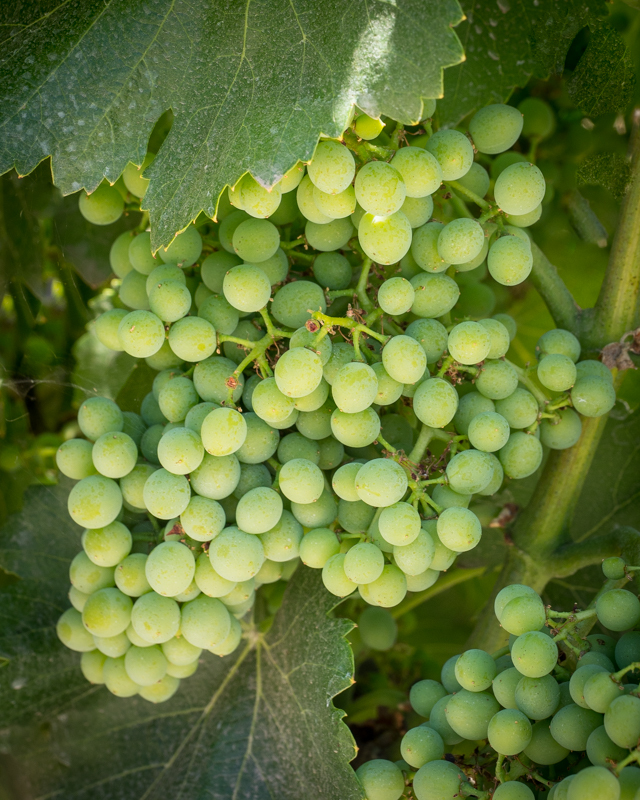 It was thought to be Merlot for about 100 years. The 24th was quiet although we tried to see the new Star Wars movie in English. No luck with the movie. The 25th was also quiet although we shared Christmas dinner with Deb and Kevin. On the 26th we went back to Aeropost to see what was happening with our packages and was told maybe six more days. At least now, the packages are in Chile. While in that area we visited the Palacio Cousiño – the former mansion for the Cousiño family – and had a English-speaking guide take us on a tour by ourselves since no one else was there. 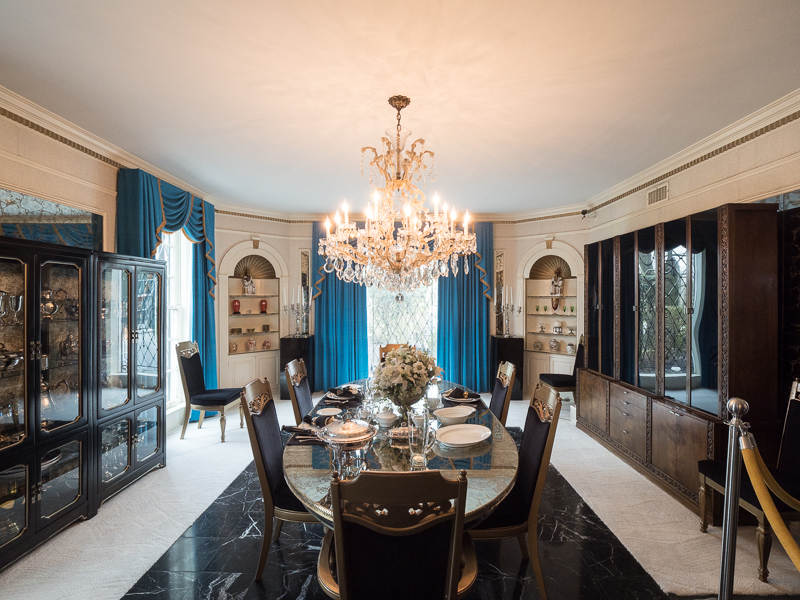 The mansion is gorgeous and the main floor and furnishings are original although the top floor was damaged in a fire and has been replaced by the Chilean government with lesser quality items and copies. We tried for the movie again but the times just didn’t work out. We decided to leave Santiago and go out to surrounding environs while waiting for Aeropost. For more on those locales, see next post. 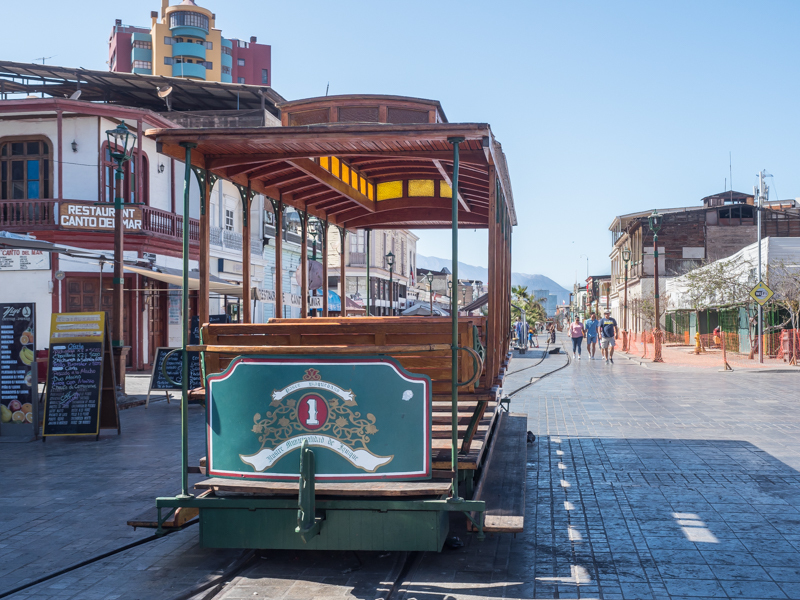 On Sunday Dec. 3rd we took a taxi into the historic center of La Serena. The main plaza was empty of people because Chileans don’t get going until 8am and on Sunday closer to 10. The only area that had activity was the La Recova market. So we walked back down to the Jardín Japonés – Japanese garden – located just north of the Plaza Nobel Gabriel Mistral. Nice size garden that Canon cameras is underwriting for the privilege of setting up booths in the park, renting out cameras and conducting photo workshops in the park. Several groups of ‘students’ were utilizing their services on this Sunday morning. 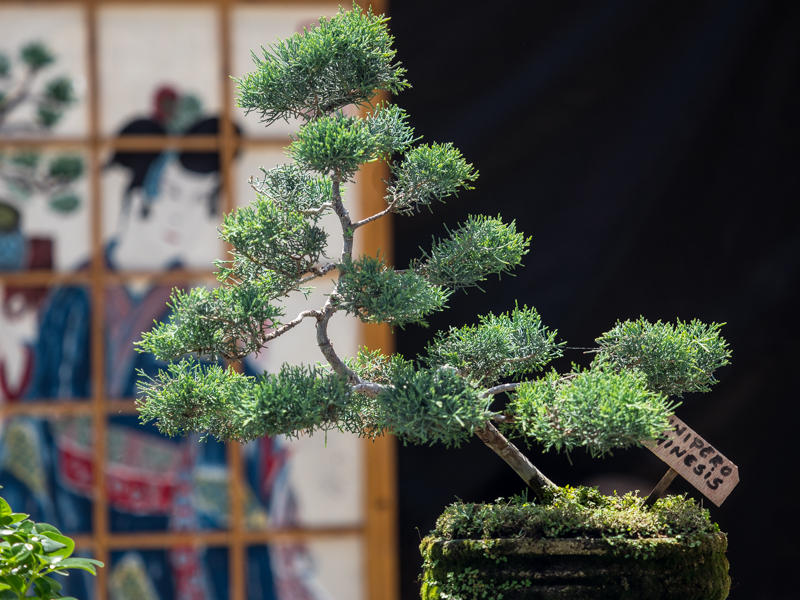 The garden had a nice selection of bonsai on display. 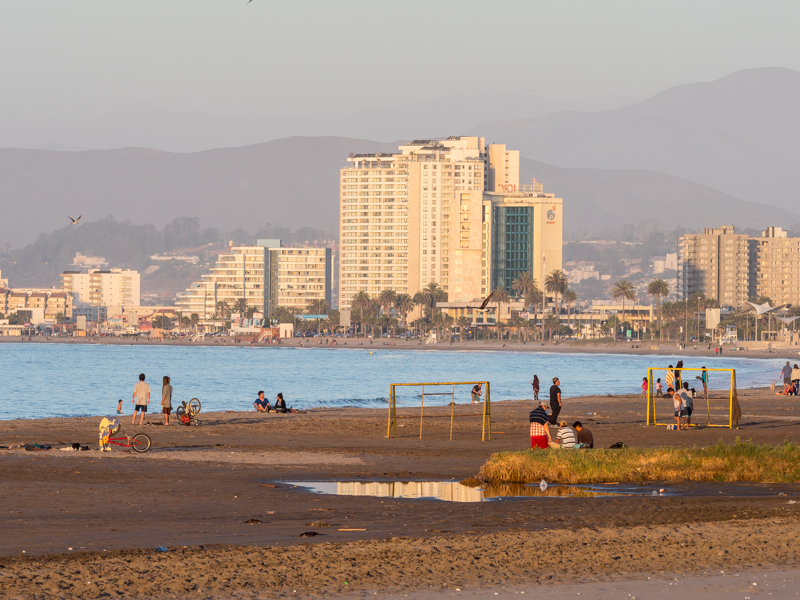 Another walk along Coquimbo’s malecón along Avenida del Mar completed our day. Dec. 4 was a lazy day that included another walk along the malecón. 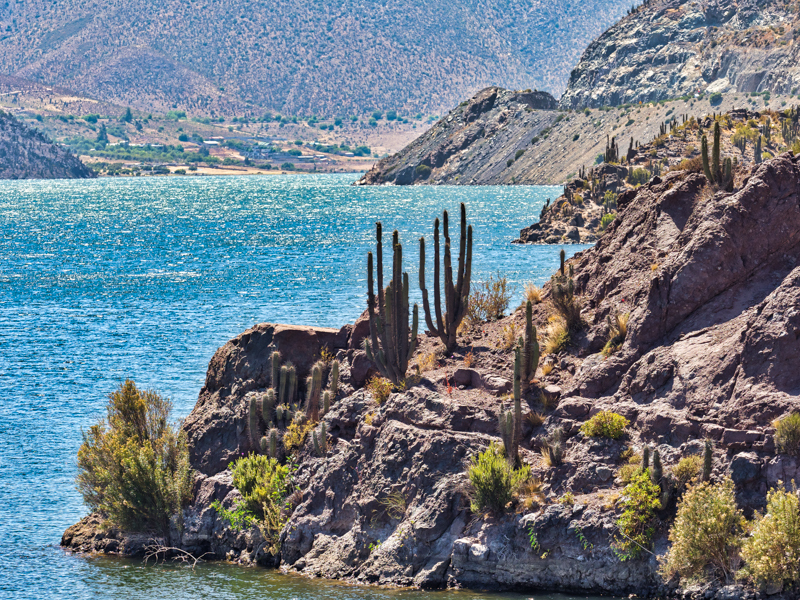 On Dec. 5, we left Coquimbo and headed inland to the Elqui Valley – prime Chilean growing region for the grapes that make Pisco (grape brandy). 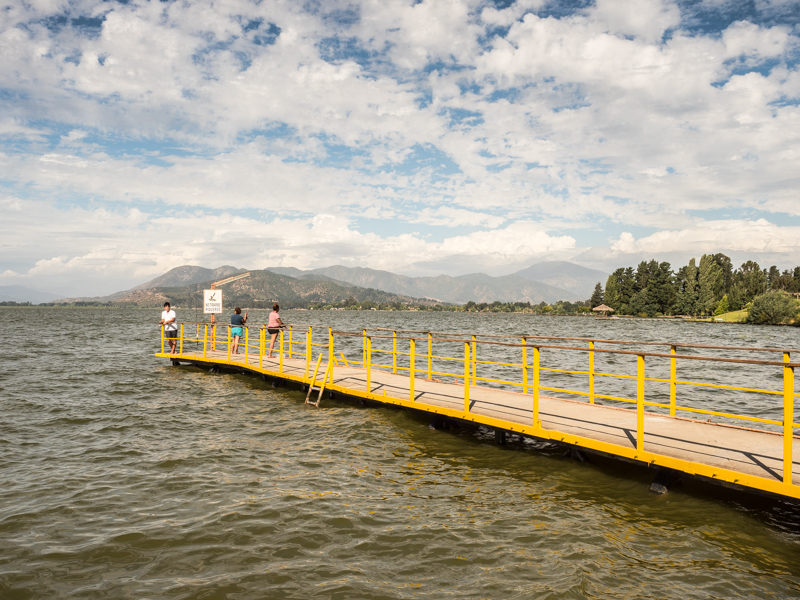 After a brief stop at the Embalsa Puclaro Reservoir to check out the dam, we arrived in Vicuña. 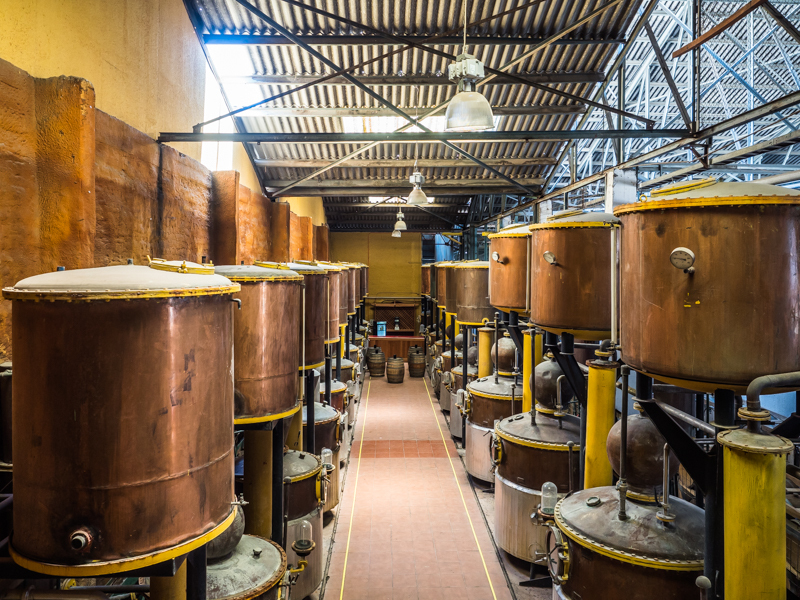 We visited the Capel Pisco distillery and took a tour that was interesting and informative. Capel is a co-op of 1500 of the region’s growers, employs 5,000+ and turns out 10,000+ bottles a day. The grounds are gorgeous, the cellars are massive and the tasting room, restaurant/bar and sales room would rival anything in California’s Napa Valley. 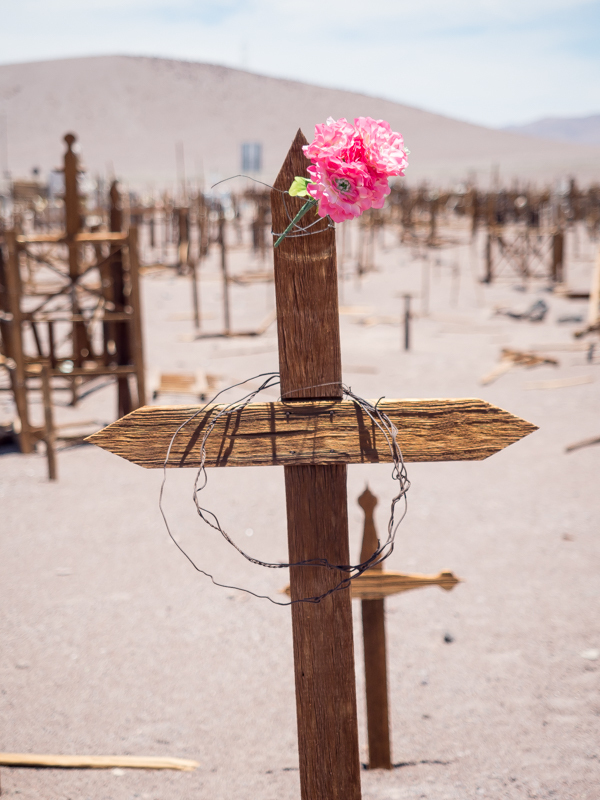 After the tour, we set up a boondock site on Vicuna’s main plaza, but had to move once because the plaza was extremely busy and our camper was too long for that parking space but we were able to find a parallel spot just around the corner on the west side of the plaza. We wiled away the afternoon watching the local children present a Christmas pageant and musical show. In the evening we took a tour up to the Observatorio Cerro Mamalluca for star-gazing. Tour groups had to actually hire a separate ‘business owner’ to provide transportation up the mountain. Our driver’s vehicle was not up to the task and the driver had to literally creep up the mountain and even had to stop and add more water to the radiator once the ‘Check Engine’ light came on. After finally arriving, we took the English-speaking tour which was the smaller group and set off. The Astronomy guide spoke good English, was informative, interesting and obviously enthused about his career. This night the moon didn’t come up until later so we were able to see the stars well. 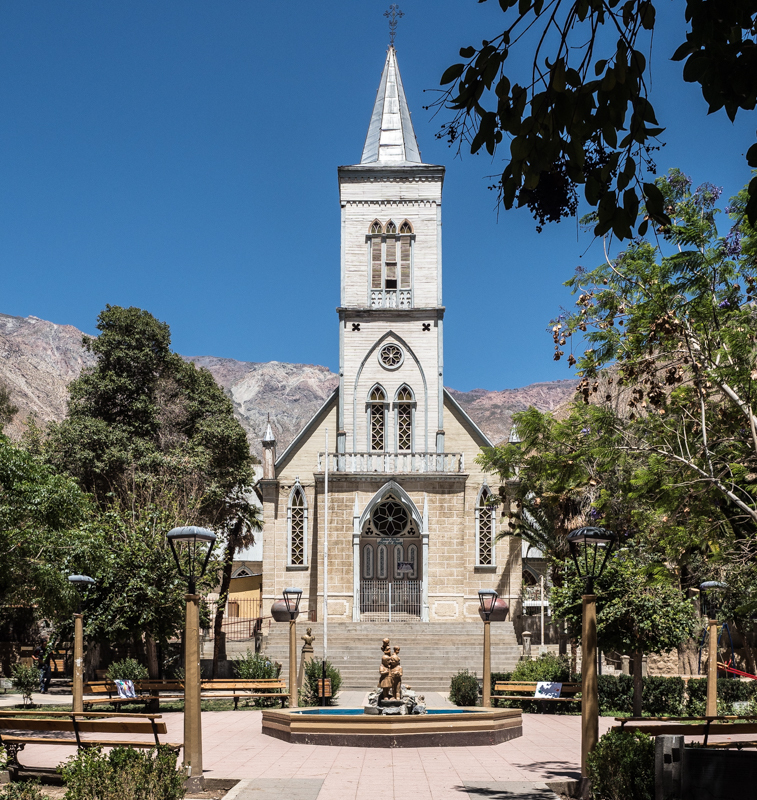 On the 6th, we drove further up the Elqui Valley on D-485 along the Rio Claro to the town of Pisco Elqui where the Mistral Pisco distillery is located. Along the way we stopped at Cavas del Valle – the only winery in Elqui Valley actually using their grapes to produce wines – not Pisco. After lunch, we retreated back down to La Serena’s outskirts and headed south on #43 to Ovalle and then turned west to Monumento Arqueológico Valle del Canto. We boondocked outside the Monumento’s gates on private land but received permission from the owner’s son who was out dirt bike riding. 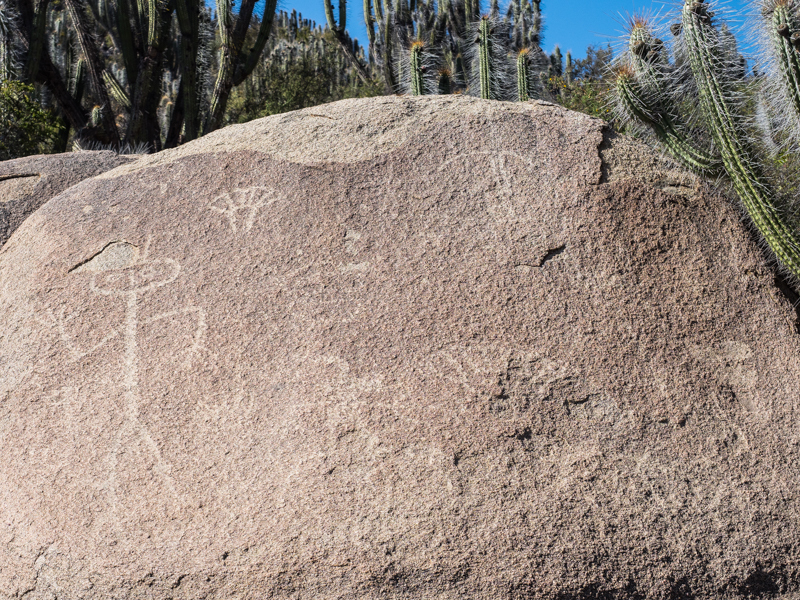 Early on the 7th, we hiked around the dry and arid Monumento looking for petroglyphs and other signs of early Chilean cultures. Us and two busloads of teens who chatted throughout their hikes. 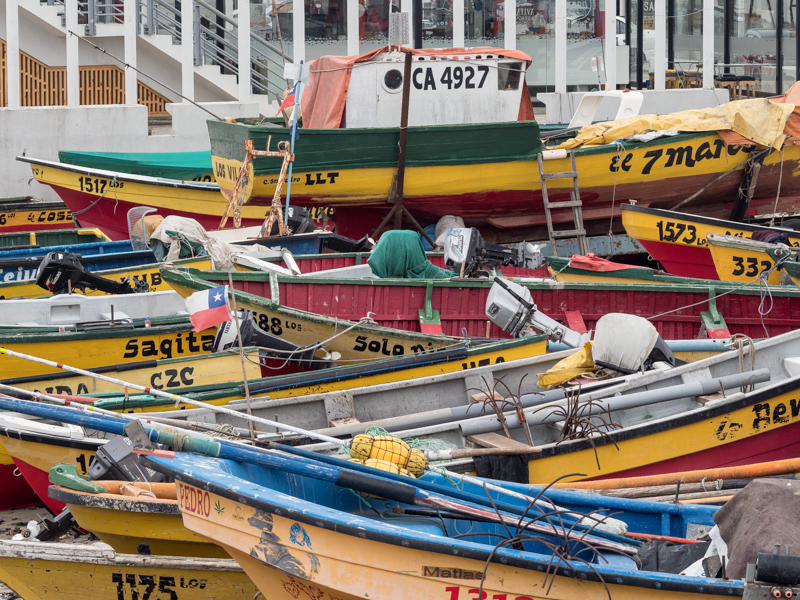 Then it was back to Ruta 5 and once again south along the Coast to Caleta Los Vilos where we boondocked on an oceanfront street across from the docks. For the first time we saw three southern sea otters frolicking in the surf. 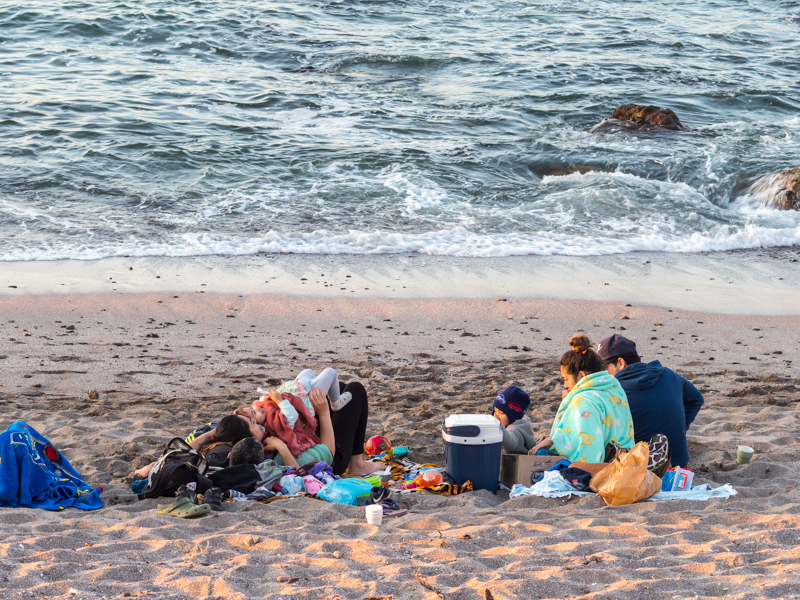 We drove straight through on Friday Dec. 8th to Rancho Casanova campground on the outskirts of Viña Del Mar and settled in after navigating their 400 meter driveway over and through road construction obstacles. We left the truck/camper at Rancho Casanova on the 9th and took Uber into Valparaiso where we had booked rooms at the Hotel Da Vinci. 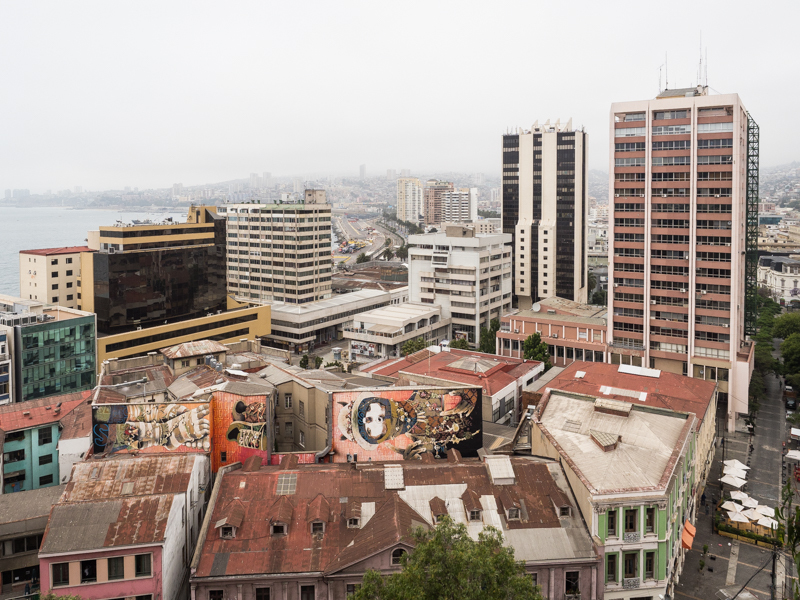 We had decided to leave the truck/camper outside Valparaiso because this bustling and active port town has narrow streets set on numerous hills and is not known for its security and parking would have been impossible. 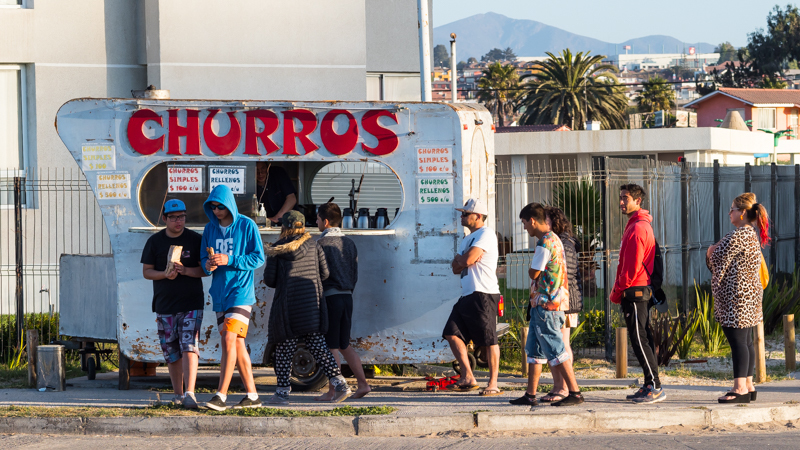 In many ways, Valparaiso reminded me so much of San Francisco. 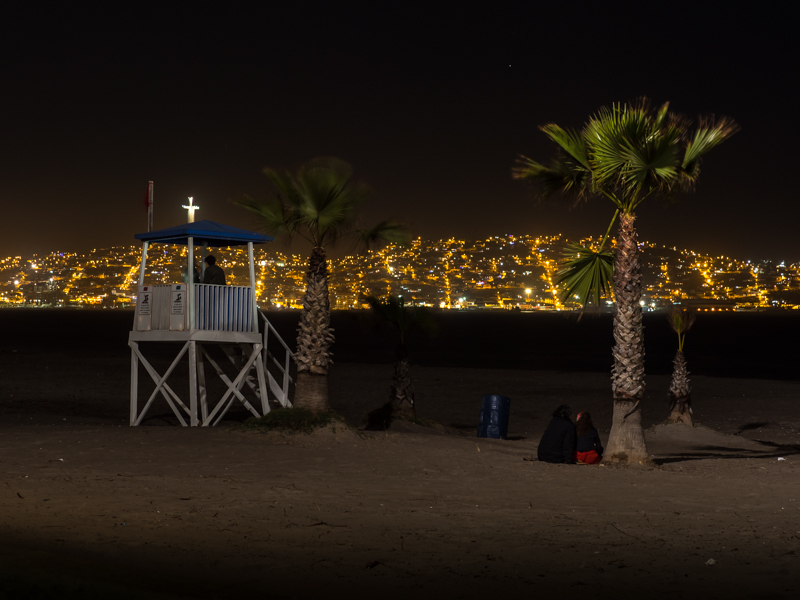 Numerous hills as mentioned above, active port, tourist town with cruise stops, old mansions and houses subject to restrictions on historic restoration, colorful murals everywhere, a 1906 earthquake that devastated the city and foggy, cool and damp weather. But on our day of arrival, it was sunny and warm so we climbed one of the ‘hidden’ staircases to the Palacio Baburizza. 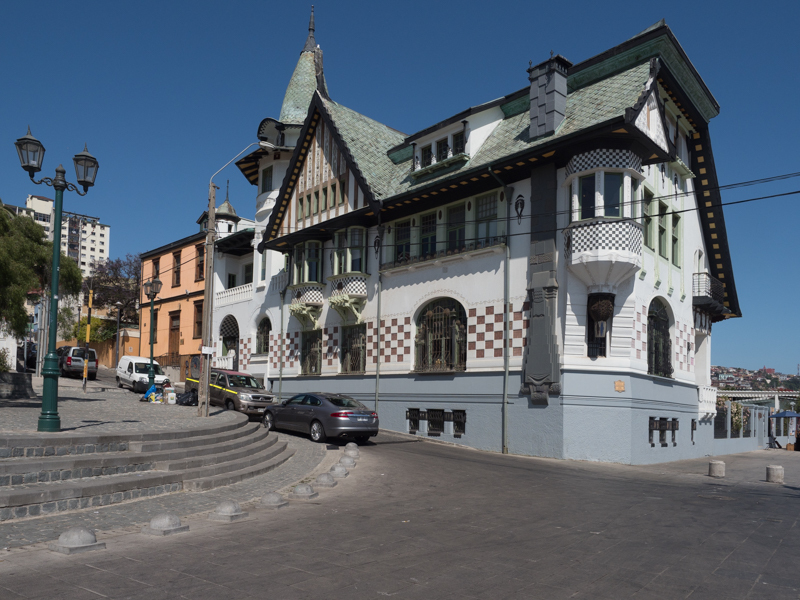 “Palacio Baburizza is the former residence of Croatian businessman Pascual Baburizza. It was built in 1916 by Italian architects, and eventually turned into a museum in 1971, and declared a historic monument in 1976. For our return trip down the hill we took advantage of one of the 11 still working funiculars out of the original 30 called Ascensor El Peral. 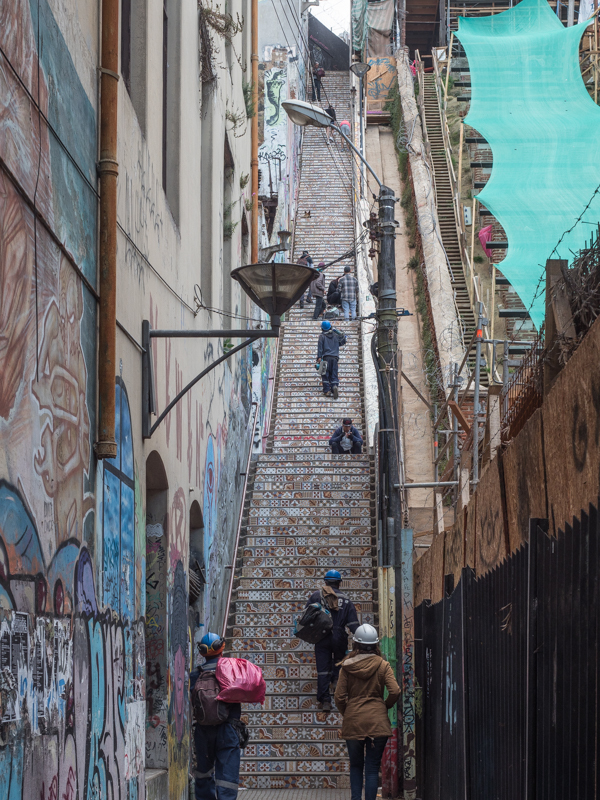 On the 10th we decided to take the Valparaiso free Walking Tour which turned out to be quite informative even if it did mean climbing hill and dale. 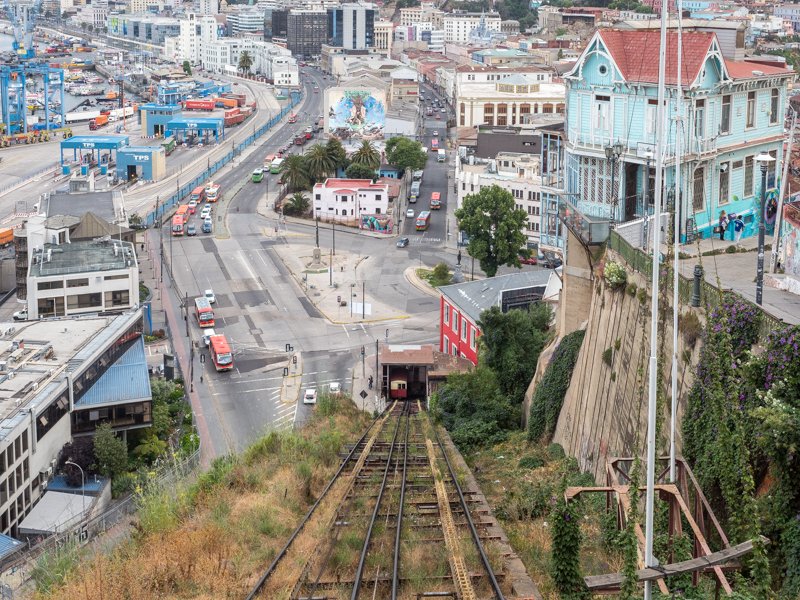 And we did get to take two funiculars: El Peral and Reina Victoria. 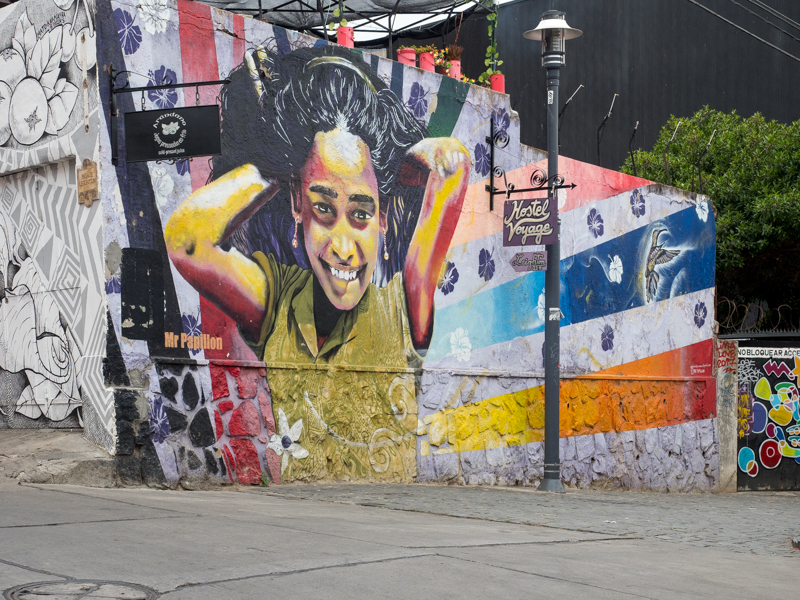 The guide pointed out the stories behind many of the murals as well as the staircases; many which are painted with their own story. Turned out to be foggy all day. Dec. 11th found us in a cooking class with Gonzalo Lara. It didn’t start out well, he was late picking us up and then didn’t provide much information as we were going through the market. We just trotted around behind him. After driving to his house, we met his wife, uncle and father. We spent the rest of the morning chopping, slicing and dicing preparing five dishes including a ceviche, a salsa, a typical Chilean tomato salad and two different, what he called casseroles, dishes. (More like risottos but with a cornmeal polenta base instead of rice.) Gonzalo was impressed with Dave’s knife work. We had everything prepared around 1:30 and his family, who did speak some English, joined us for lunch. His father brought out a bottle of wine and we enjoyed the efforts produced by our morning of cooking. Afterwards he drove us by Pablo Neruda’s Valparaiso house and we made stops at an empañada shop, a bakery with the oldest oven in Valparaiso, a meat carnicería and finally a sweets shop for various samplings. During the 12th we just rested and only made one excursion on the Ascensor Artillería funicular up to the Paseo 21 de Mayo where we spent time watching the loading/unloading of the very busy container ship port and the approaching sunset. How’d you like to climb this after a hard day’s work? The 13th and later days’ activities in the next chapter. 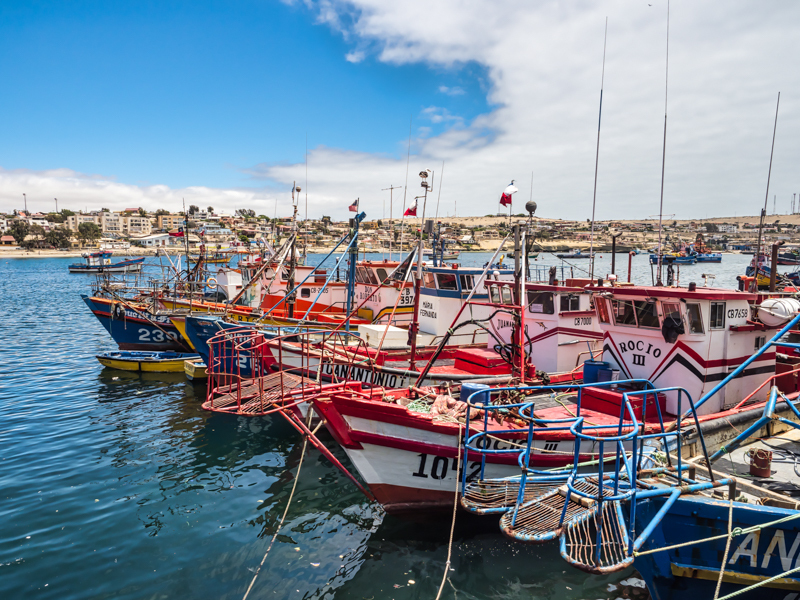 Antofagasta Chile – what another surprise. 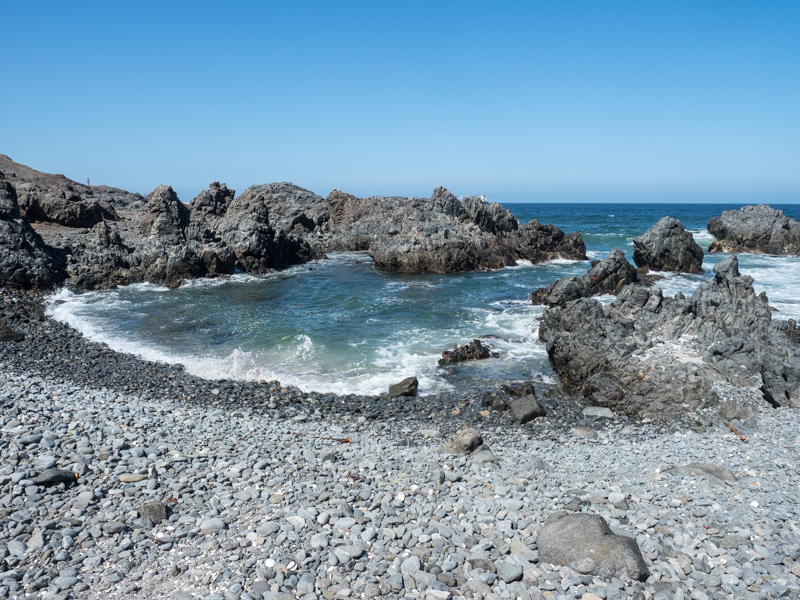 Dave and I are beginning to really like the coastal cities in the far north of Chile. 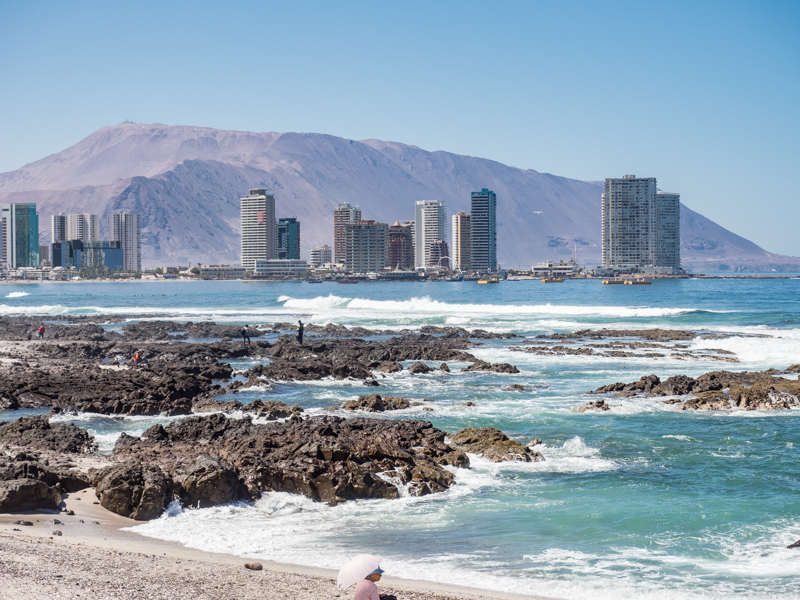 Antofagasta is similar to Iquique but its location isn’t set against such a towering sand dune like Iquique. 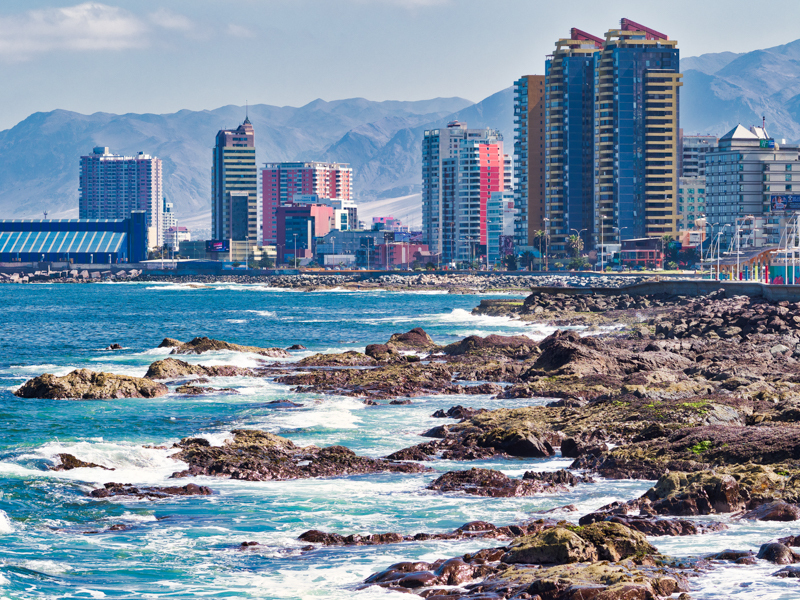 It is, however, like Iquique set between the coastal range and the Pacific Ocean. Antofagasta is slightly bigger population-wise; both are major seaports servicing primarily the minerals being mined in the Atacama region for export, both have wonderful seaside malecóns, both have high rise condominiums and apartments scattered throughout their cities, both have interesting historic centers relating to the colonial exploitation of the Chile’s mineral wealth, and both have an arid climate with temperatures in mid 70’s and both are foggy in the mornings clearing by noon. 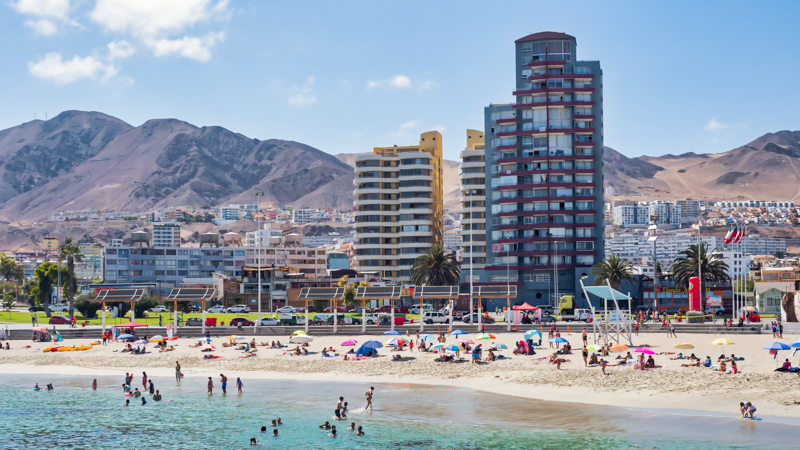 On the 26th, we wandered south along the Antofagasta malecón to a municipal beach and watched the Chilean families enjoying a variety of water activities and sunbathing. I became engrossed in watching one novice kayaker who spilled into the water trying to regain his seat in the kayak. No luck, he finally had to swim to shore towing the kayak. Reminds me of Pacifica where you put on a jacket when going to the beach. 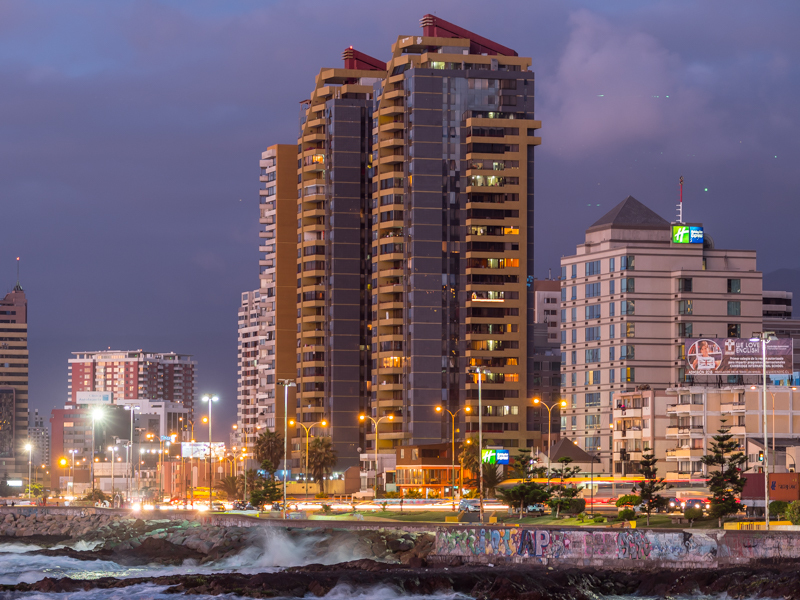 The 27th found us wandering in the northern direction along the malecón and into the downtown historic area to the Plaza de Armas. 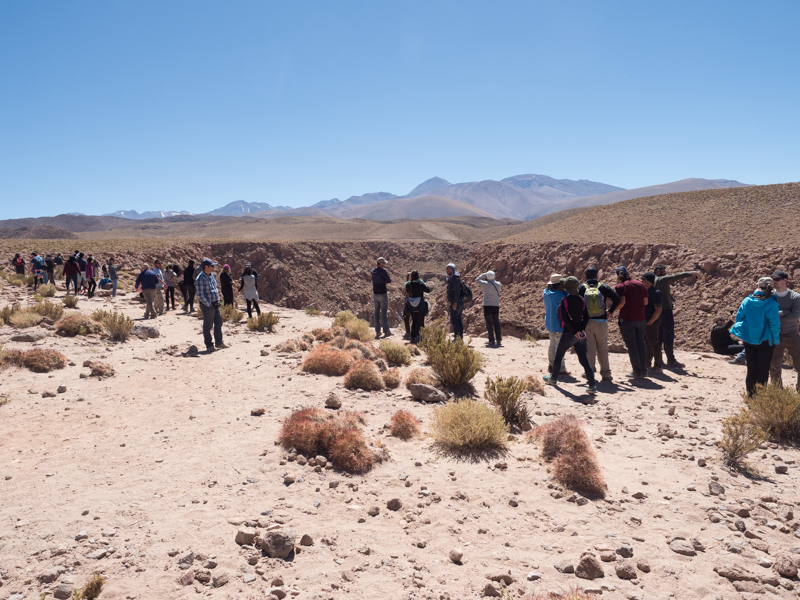 In the evening we made arrangements to take an astronomy tour to do some star watching since Northern Chile has almost ideal observing conditions to watch the stars and Chile has a number of international observatories scattered through the Atacama Region. 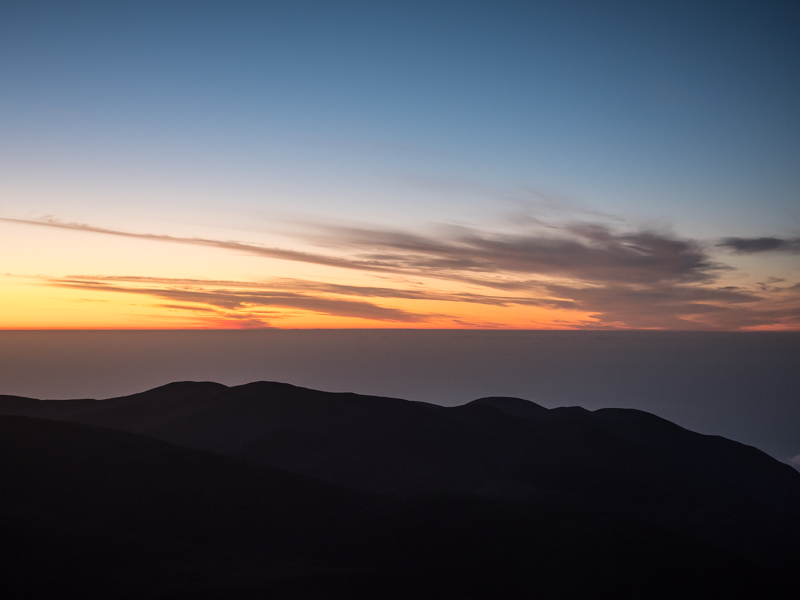 Minimal water vapor in the atmosphere, little cloud cover, sparse light pollution and high peaks for stationing the observatories make for some of Earth’s best viewing of the stars. I thought our tour was to an actual observatory; instead it was an astronomer phd. instructor and his student who drove us up to one of the peaks south of Antofagasta, set up his large professional telescope and ‘lectured’ us on what we were seeing. Interesting fact: the telescopes are now aligned using gps. He was knowledgeable and didn’t make it too technical so we could understand him and he spoke good English. So even though not what I was expecting, it turned out to be a good evening even when the almost full moon cast so much light it started to blur the stars and planets. On the 28th we left the Coast briefly on Highway 5 to drive to Chañaral. 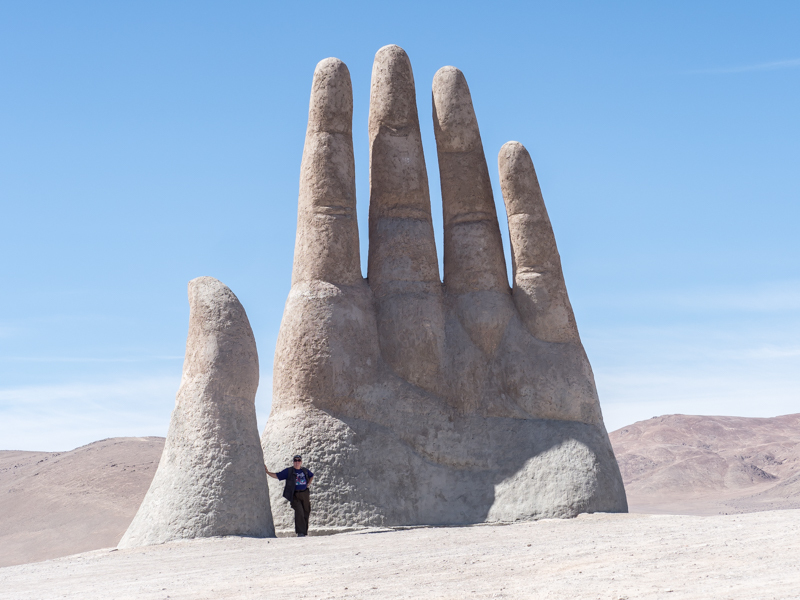 But on the way we stopped at the El Mano del Desierto ‘weird’ sculpture set out in the middle of the windswept desert and a second even odder stop – an old huge abandoned historic cemetery for the mining company – Oficina Chile. 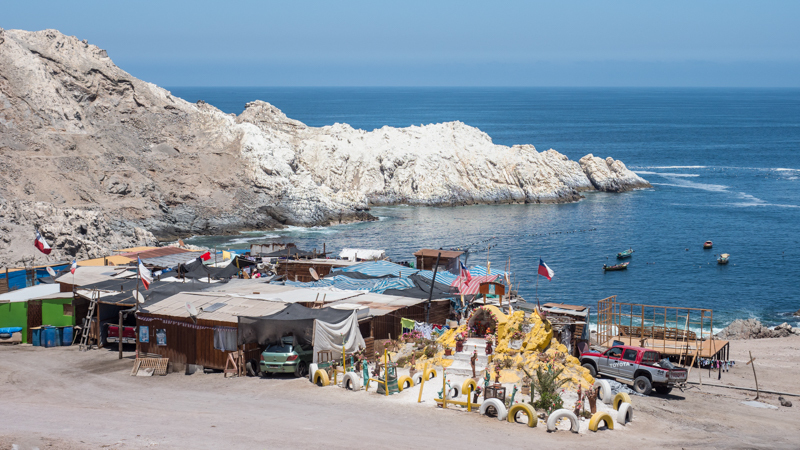 After arriving in Chañaral, we boondocked at one of their oceanside parking lots above some docks. 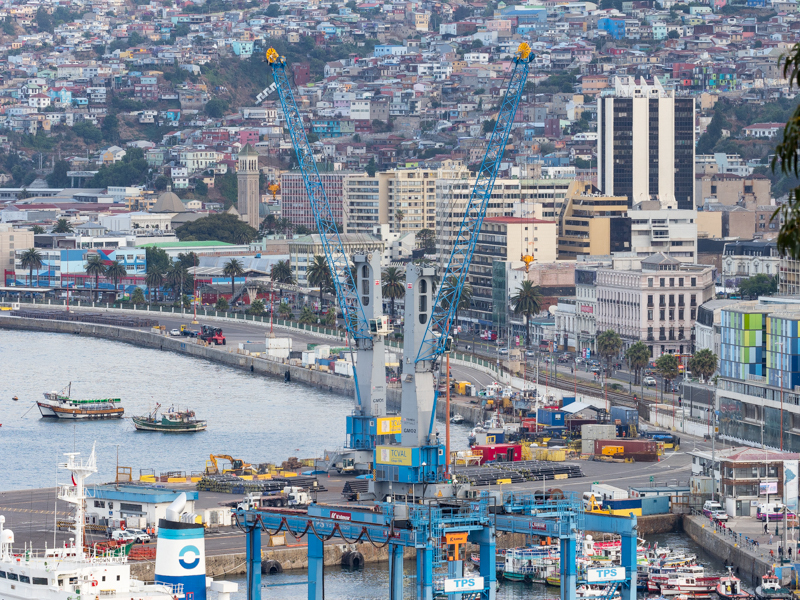 We have noticed, and there are big government billboards making the announcements, Chile is in a big infrastructure municipal projects boom. We have seen work on town boat ramps to service their fishing and tourist industries, bridges on small roads across, mostly in this area, dry streams and river beds, seawalls, roads of course, public housing, water canals, town central plazas, seaside malecóns and art projects. All for “Todos por Chile”. 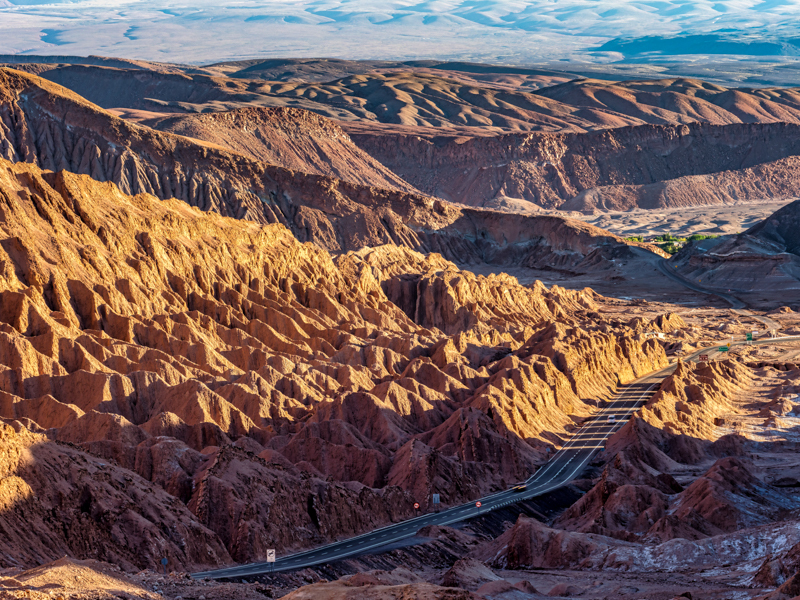 On Nov. 29th we drove north from Chañaral to the Pan de Azúcar. 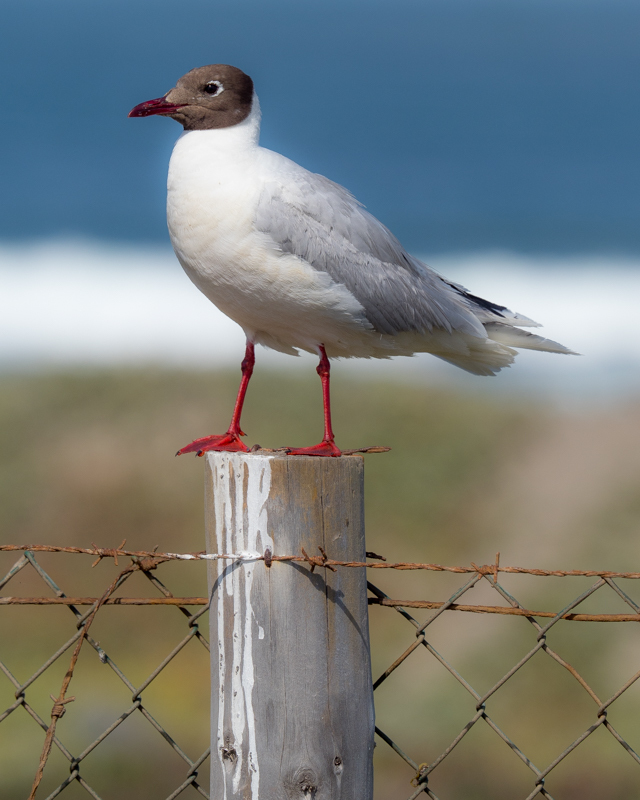 This coastal nature reserve abuts the ocean and climbs over the coastal range so it has several different habitats for plants and animals. One of the islands offshore is a Humboldt penguin nesting ground. But they were not in evidence at this time of the year. The dirt road leading to the reserve is in good shape but when we tried to take the side spur to the Mirador, it quickly became worse. So after a short while we returned to Caleta Pan de Azúcar and boondocked in one of their parking lots. And watched the bus loads of children and teens come through. After the buses left, it was quiet even if windy. 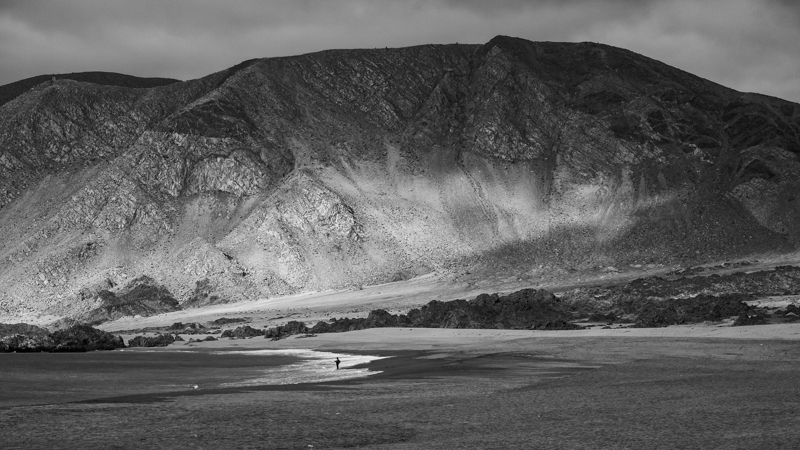 The 30th found us back on the road to Bahía Inglesa and Caldera. 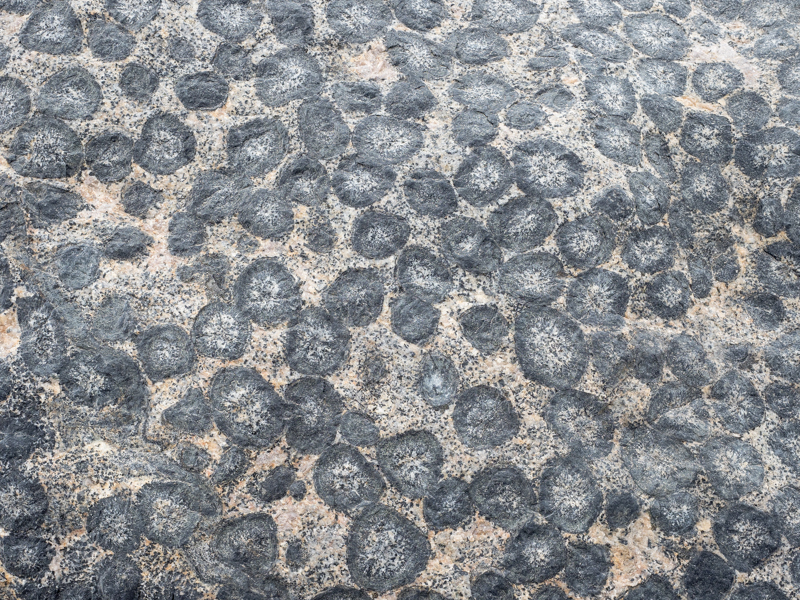 The most unusual stop during this mostly coastal road drive was the Santuario de la Naturaleza Granito Orbicular. In Caldera we visited the main square and had lunch at a restaurant in the fish market before driving to Bahía Inglesa where we boondocked in their new beach parking lot; quite a project with paved walking paths and covered awnings. After another quiet night with only the sounds of the shorebirds, we left Bahía Inglesa on Friday Dec. 1 and turned inland. 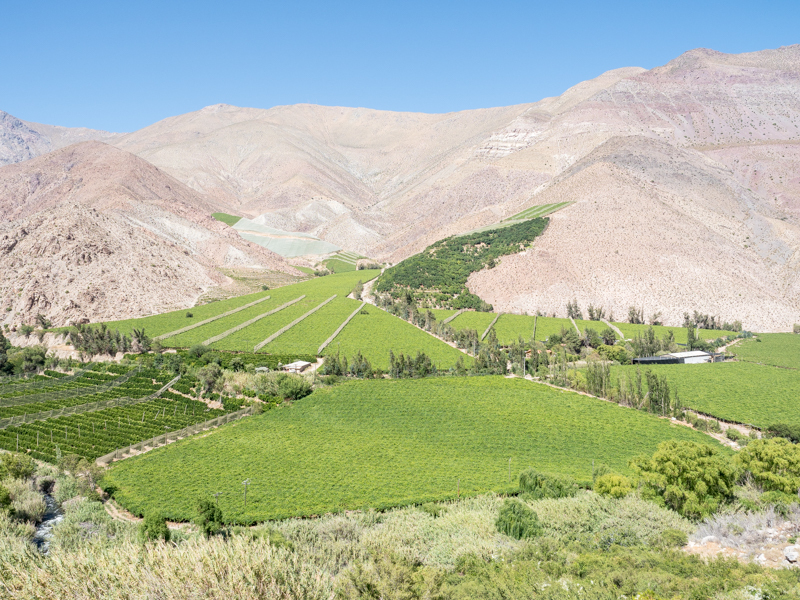 Only when we got closer to Copiapó and along the Rio Copiapó did vineyards and other farming areas start dotting the valley. What was interesting was when we continued west on C-411 back to Ruta 5 we discovered miles of vineyards covering the valleys’ floors and partially up the otherwise brown dry hillsides. After driving for some time on Ruta 5, we turned west at Vallenar and followed the verdant Rio Huasco orchard valley filled with olive trees to the port town of Huasco. Where we boondocked in one of their beach parking lots after exploring the center on foot. 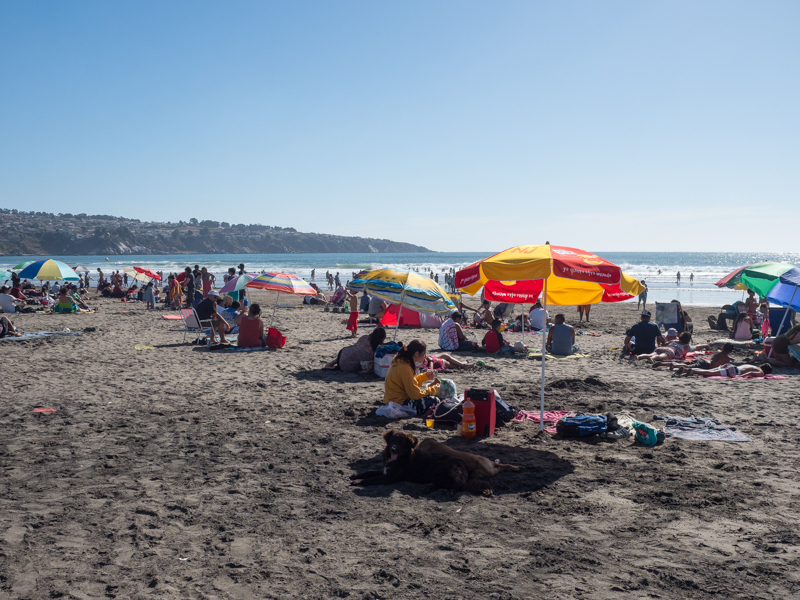 Dec. 2nd we drove from Huasco to La Serena or more precisely Coquimbo, a beach community on the southern end of Serena to the campsite Turismo El Huerto. After ascertaining that we would fit into the individualized parking slots, we put up the roof and the vent cover just nudged up the net awning over each of the slots. An unusual campground in that each of the parking spots had not only their own table, benches, BBQ pit and shelving, each one had their own locked individualized bathroom with hot water showers. Was extremely handy to leave toiletries in your ‘own’ bathroom. More on La Serena in the next entry. 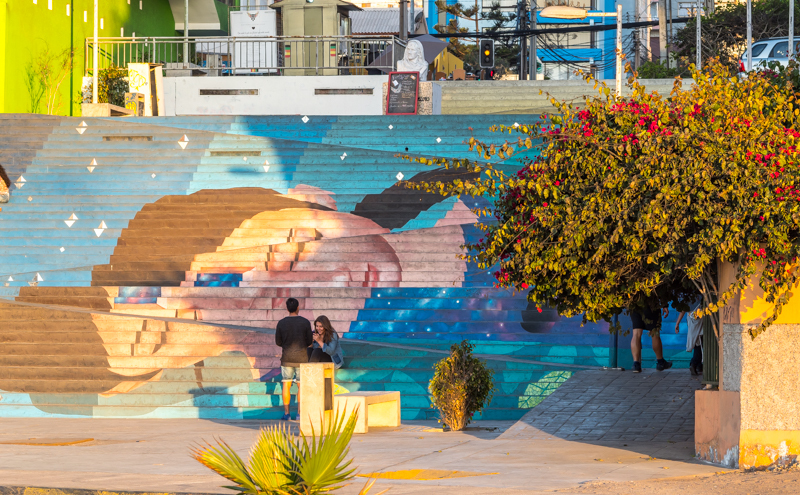 Nov 17th – was a down day in Iquique. Occasionally we need a day when we do nothing and rest up from previous drives. Weather has been glorious. 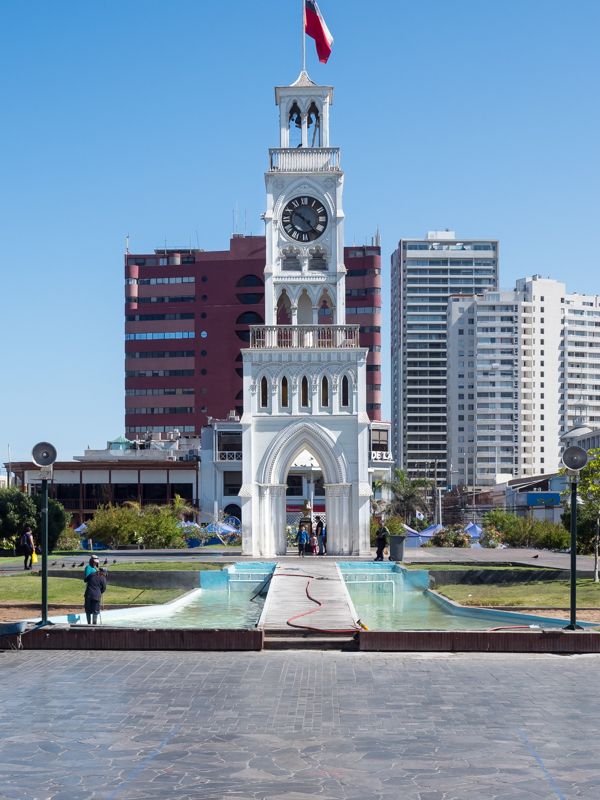 Nov. 18th – we caught a local bus and headed into the historic center of Iquique. 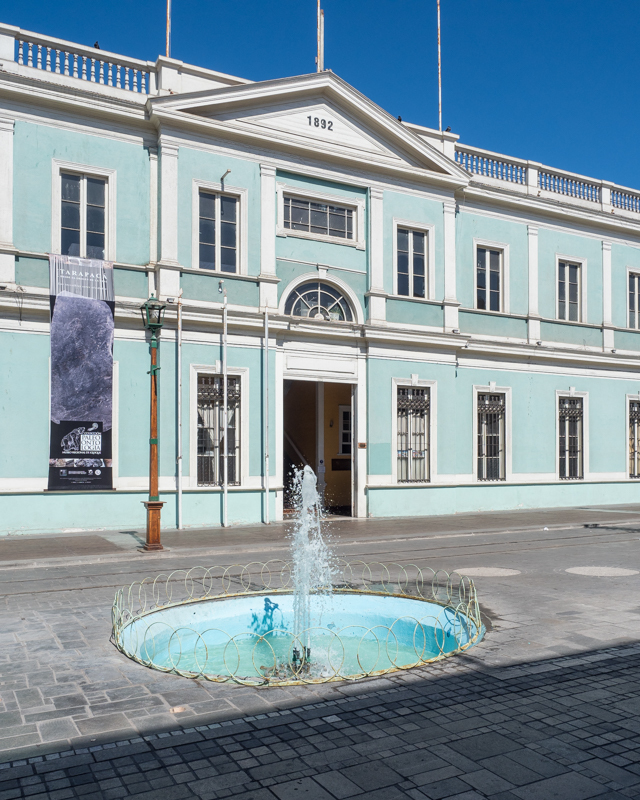 We started in the Arturo Prat Plaza to check out the Torre de Reloj (clock tower) and strolled up the pedestrian-only Baquedano Street with its colonial-era houses with balconies that are slowly being renovated and turning into restaurants, galleries, museums and shops. While there one of the two restored trolleys made its way slowly up the street. Reminded me of San Francisco’s cable cars. 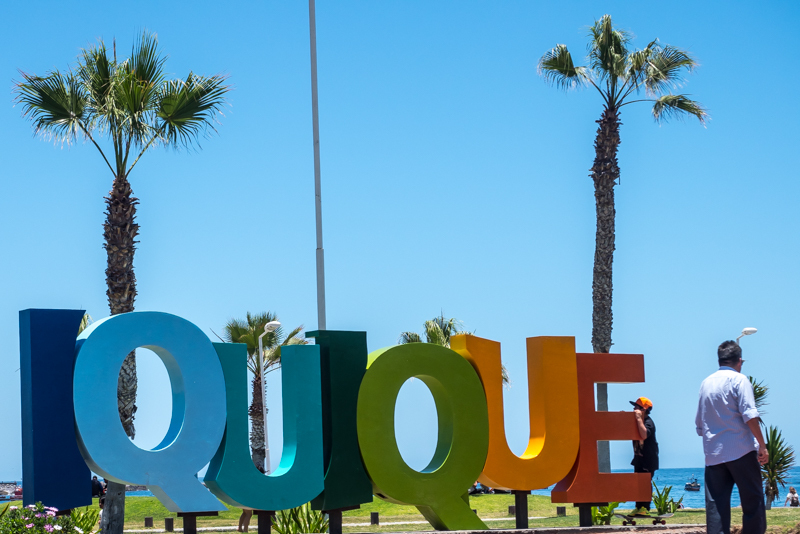 Iquique turned out to be such a surprise with its history, urban size, physical setting against humongous (technical term) sand dunes and nestling next to the Pacific Ocean, great weather for us Pacificans, lovely breezes and lack of insects. Shot from a moving taxi. 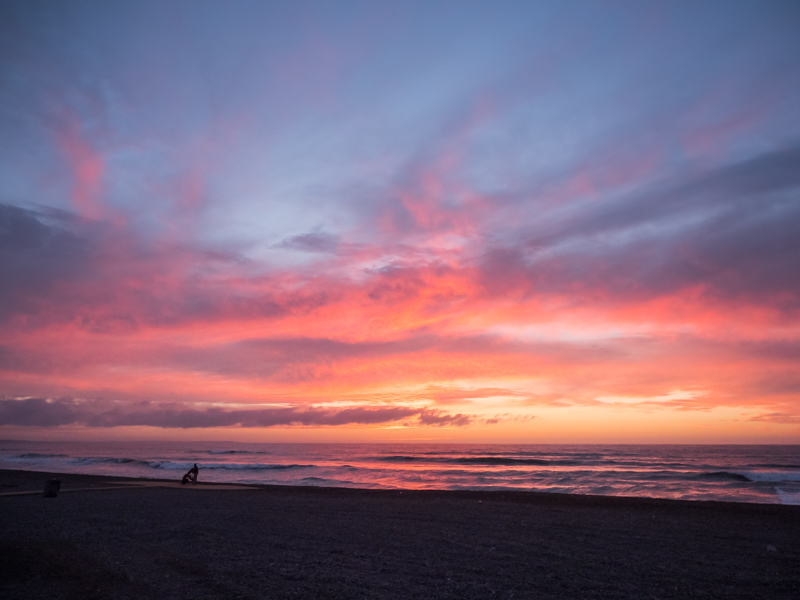 On Nov. 19th, hating to leave Iquique but knowing we need to keep going south, we left Iquique behind and followed the Coast Highway 1 staying within a few miles of the Pacific all the way to our next destination – Tocopilla. Along the way, I started noticing areas marked with white chalk on the barren sand dunes/sandstone. We couldn’t figure out what these irregular shapes were until we spotted several groups of people teeing off. They were golf courses on dirt; ‘greens’ outlined in white chalk. 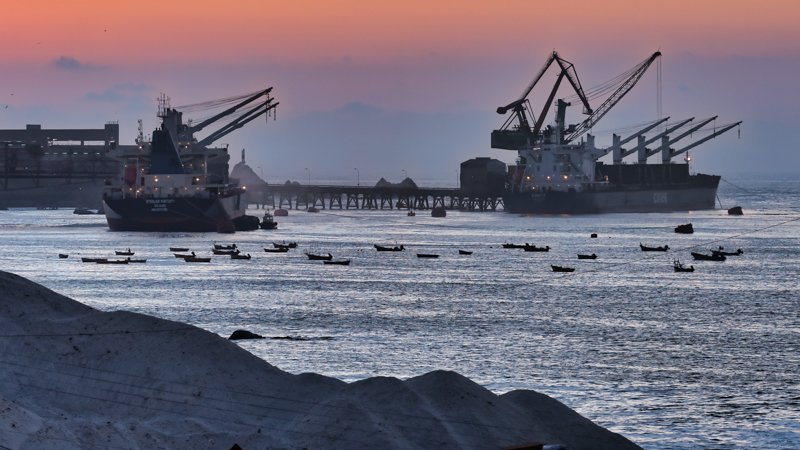 Tocopilla is a mining support town/port and is Not beautiful. But it was a good spot to overnight in; because we needed to head east the next morning up into the highlands on the next leg of our journey. 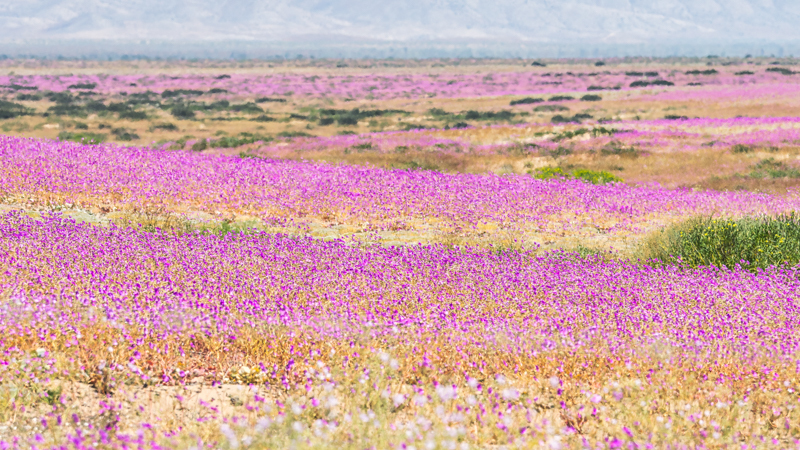 Nov. 20th saw us heading up and over the coastal hills, across the dry and sandy center basin around Maria Elena on Highway 24 to Calama up in the highlands. 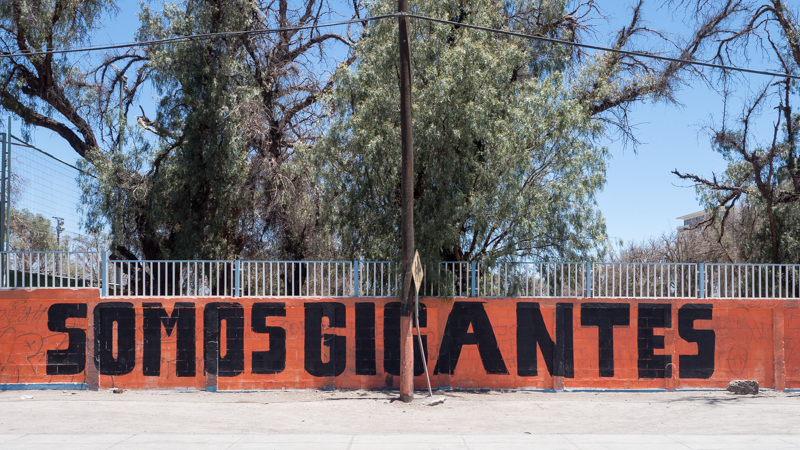 The SF Giants marketing team left its mark in Calama. 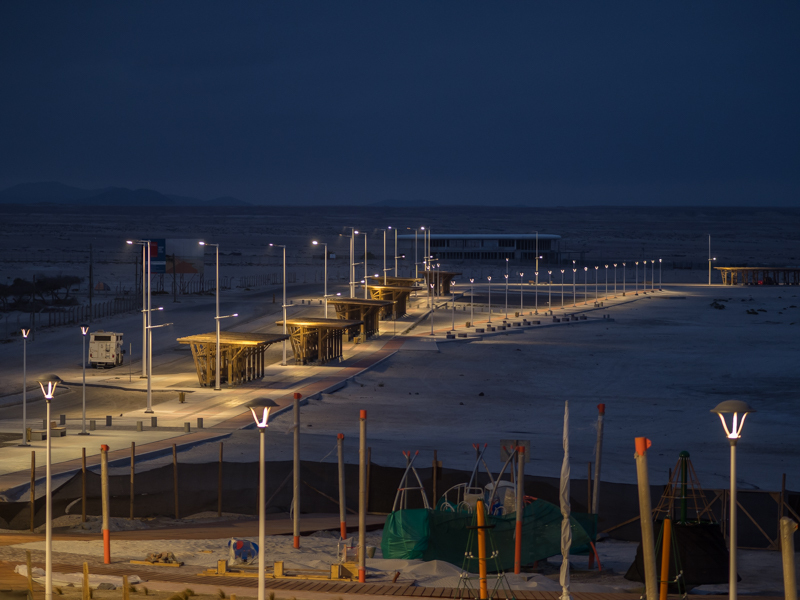 After checking into Camping Casas de Valle in Calama, we walked into the downtown area looking for the Tourist Office to sign up for the free Codelco (government-owned) mining tour to the largest open pit copper mine in the world at Chuquicamata. Turned out to be a bust. Once we found the right address, the Tourist Office had been abandoned. And we couldn’t find where it had been relocated to – if at all. 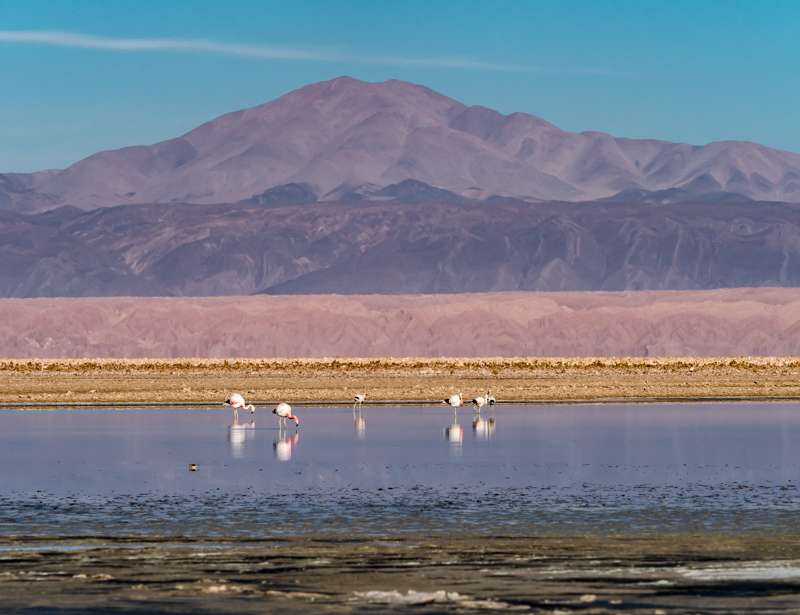 Nov 21st – We spent the day driving to San Pedro de Atacama which is at approx. 8000′ but which is an oasis in the middle of the desert. Our first campground choice wasn’t open so we spent time driving around looking for the alternative choice. Our first task was lunch and then to find a tour company to make arrangements to take us out to the Tatio Geyser Fields the next morning. 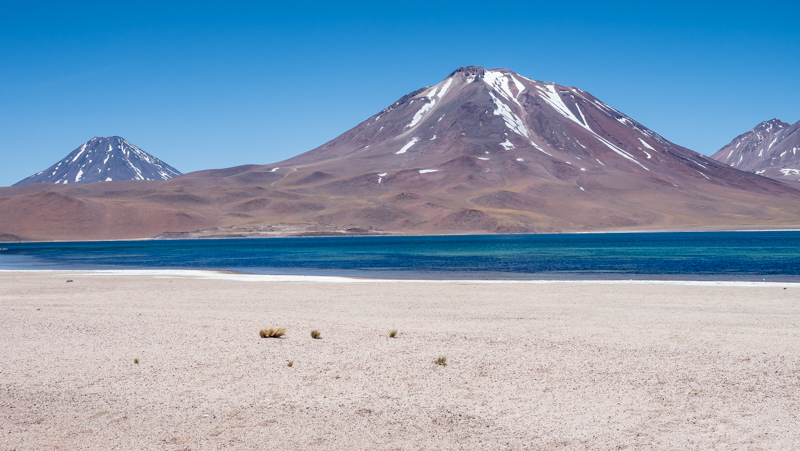 We ended up booking with Terra Extreme an afternoon tour to the Laguna Tebinquiche south of town for an evening drive as well the next morning 4:30am pickup for the geyser trip. We wanted a tour company because we knew the road to the geyser fields was not paved and didn’t want to drive the camper over 50 miles of notoriously bad dirt road. 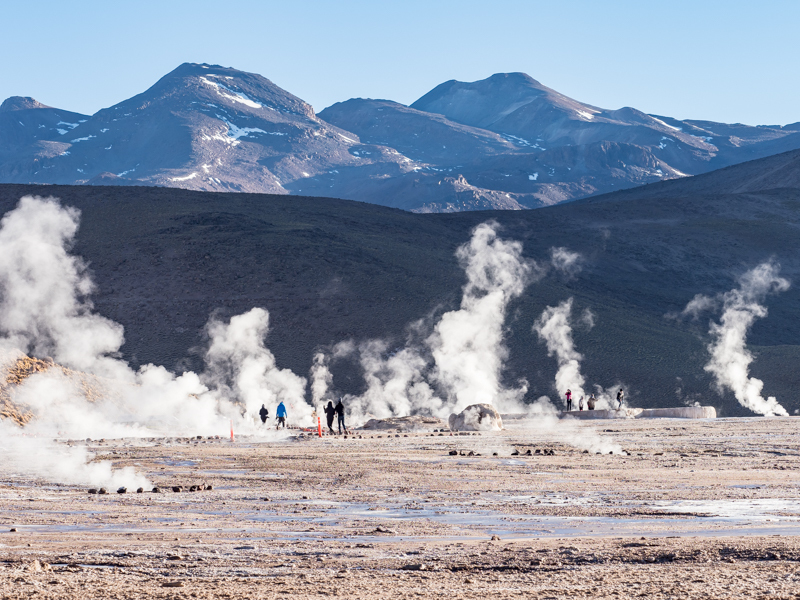 Weds 22 – Tatio Geyser Field. It was our mistake to take a large tour; we should know better. 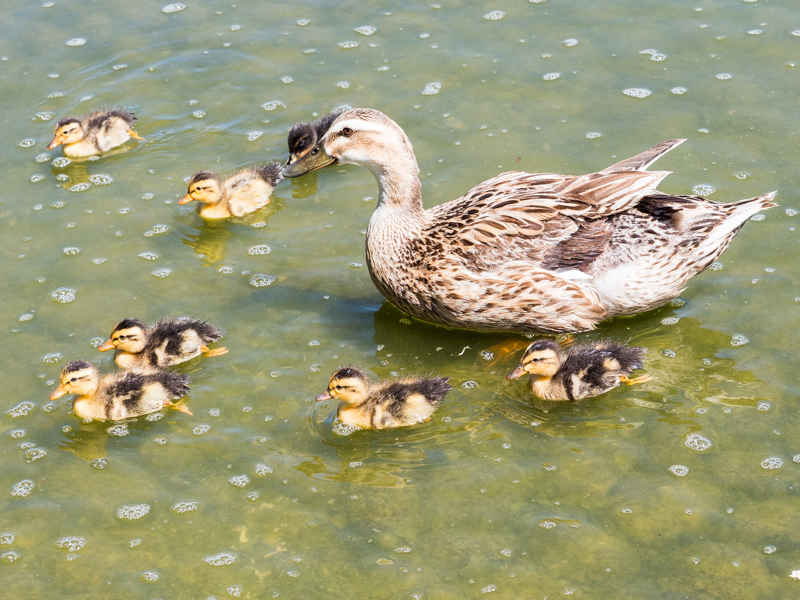 The tour companies herd you through, insist everyone stay together in one group and there is limited time to photograph. And when we arrived at the geyser field (which pale in comparison to Yellowstone btw), we were one tour bus out of 20-25. So people were everywhere. On the other hand, their vehicle took the beating over the washboard road. Why we avoid organized tours when we can. When we arrived back in San Pedro, we had lunch, retrieved the camper and drove south on Highway 23-CH to see if we could get into A.L.M.A. (Atacama Large Millimeter Array – a large grouping of radio antennas watching the skies.). But discovered not open to public unless with your group. We ended up boondocking in laid back non-touristy Toconao on their plaza. But the tour companies make this an evening tour stop (to show off the historic church tower badly in need of repair) so around 5-6pm, the plaza was filled with tourists from San Pedro but they eventually cleared out so the locals could enjoy their Zumba class. Finally everybody settled into their small town sleepiness routines and it was quiet overnight. Thurs. 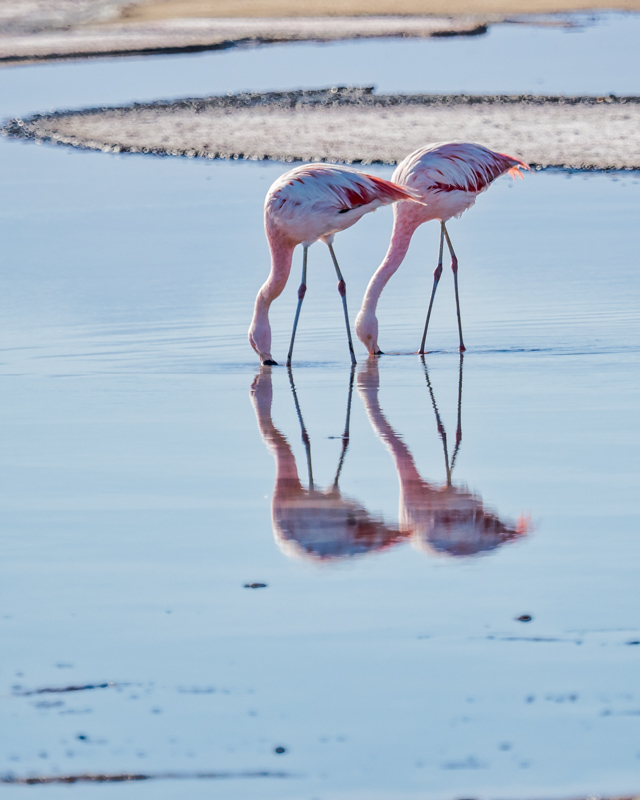 23 Thanksgiving – We awoke early and drove out to Laguna Chaxa which was larger than the previously visited saline lakes, fewer tourists and more flamingos. 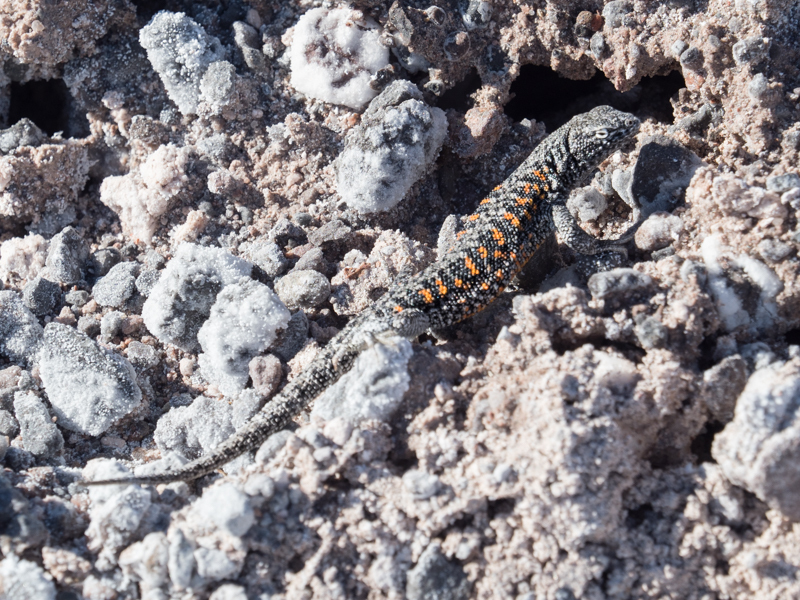 Plus many other bird species and lizards. A couple came up to us and asked us if we had driven all the way from CA after they spotted our license plate. Turns out they were living in Washington DC and the gentleman grew up in San Bruno – a suburb close to Pacifica. And we exchanged Thanksgiving greetings – a nice touch for our Holiday. 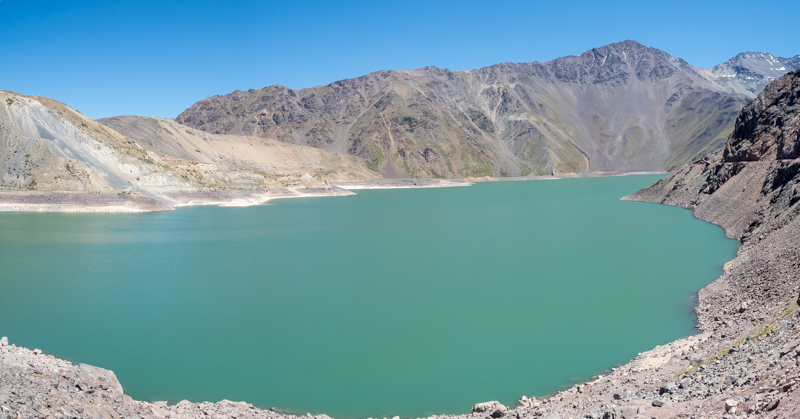 After enjoying our walk along Laguna Chaxa, once again we headed south to the high Andean Lakes, Laguna Miscanti and Laguna Miñiques (mostly paved road except side road which was 6km one way). Beautiful terrain across flats and up into the lakes area. 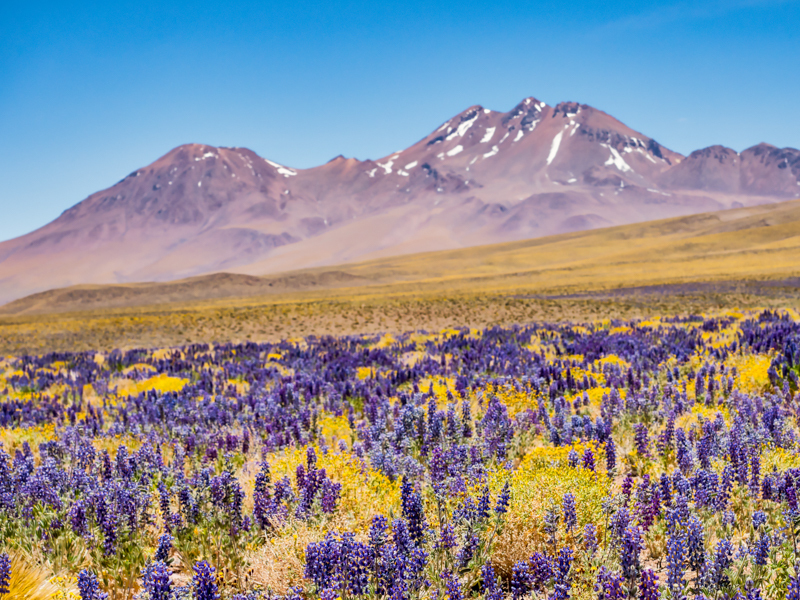 We crossed the Tropic of Capricorn line (we’re slowing making our way south), surprising immense fields of lupine in bloom in this dry area, towering volcanoes and breathtaking views across the flats. After returning to San Pedro, we checked into Glamping Alta de Quitor a few kms. northwest of San Pedro so we could get an early start on the Cordillera Sal as well as the Valle de la Luna. 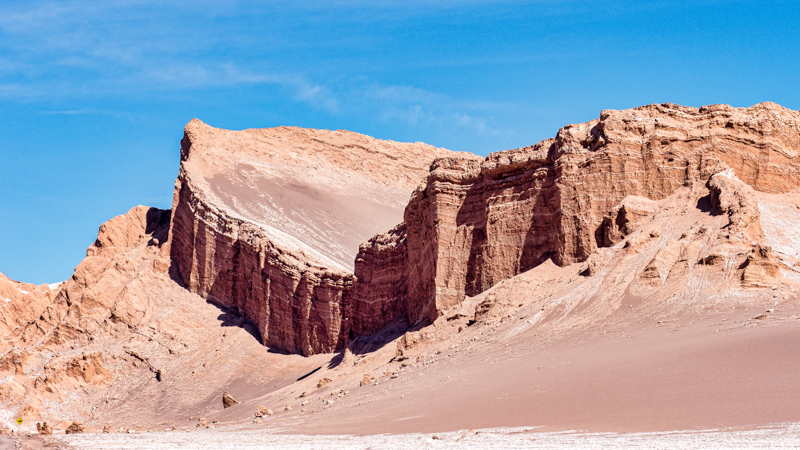 Nov. 24th – we ended up spending all morning at the Cordillera and the Valle de la Luna with their wonderful and colorful rock formations, large sand dunes and canyons. 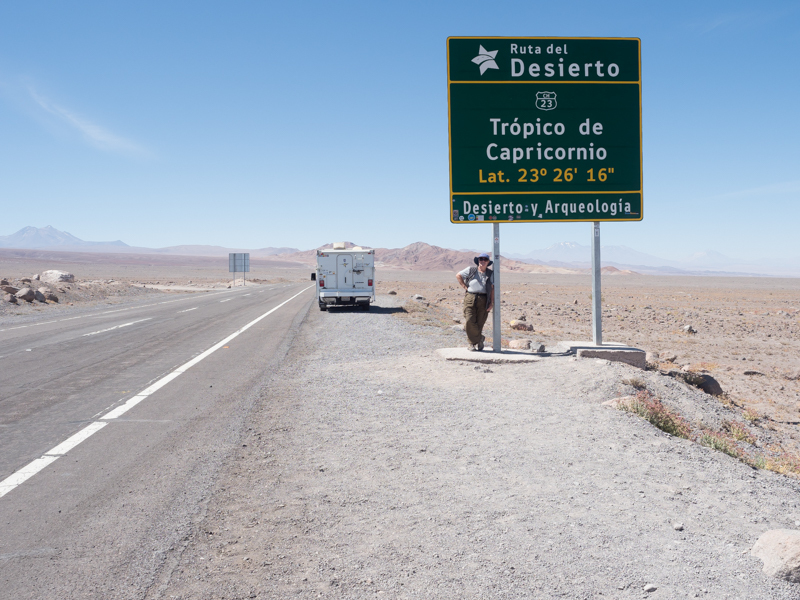 After leaving the San Pedro area, we returned back to the upper plateau and boondocked at a Calama Shell station. Gas stations are generally noisier than other locales; on the other hand, they are open 24 hours offering a level of security. Leaving the high Andean plateaus once agin we headed down across the arid, and mostly barren, central Basin to drive to Antofagasta. 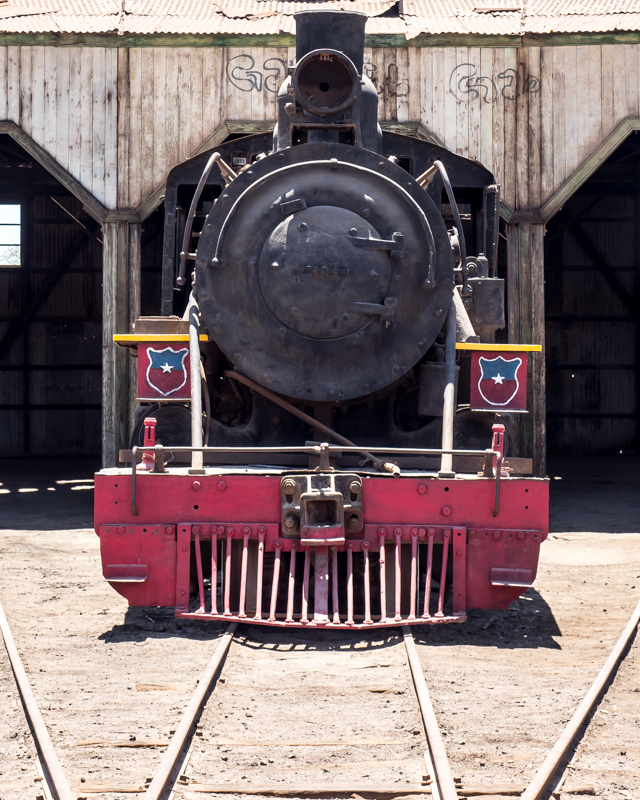 On the way we stopped at the historic mining ghost town of Oficina Salitrera Chacabuco to wander around. When we first arrived, we were the only one there and the dogs had to alert the custodian to let us in. 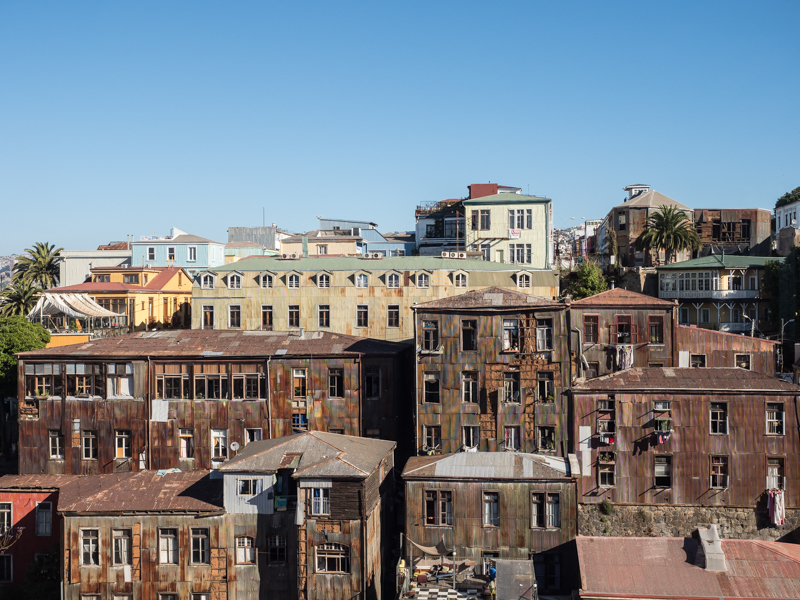 But more haunting was the fact that after the mining and processing operations closed in the 60’s, Dictator Pinochet after the military coup, used it in 1972-1974 as a detention camp for political prisoners who subsequently ‘disappeared’. We crossed over the road, through the historic railroad station grounds to the railroad ‘museum’. Not really a museum as such, just abandoned train cars, locomotives and cabooses. Most interesting aspect was the repair house turntable that could bring in 13 locomotives at once. Arriving in Antofagasta, we checked into the Holiday Inn Express – our third choice since they would allow us to park in their portico. See the next blog entry for the continuing travelogue.